Owner and operator of PHOTOGUIDE.JP and photojpn.org. Amanohashidate from Kasamatsu Park, Kyoto. “Kyoto by the Sea” (海の京都) is a tourism catch phrase for northern Kyoto Prefecture that mainly faces the Sea of Japan. 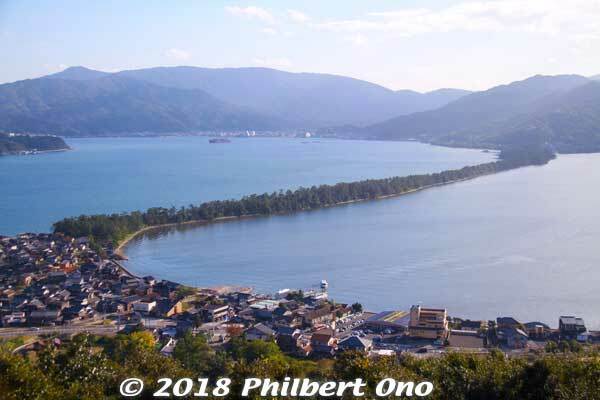 This region is most famous for Amanohashidate (天橋立), Ine fishing boat houses, Tango Peninsula, Tango chirimen silk fabrics, Kurotani washi paper, Maizuru navy town, and the castle town of Fukuchiyama. 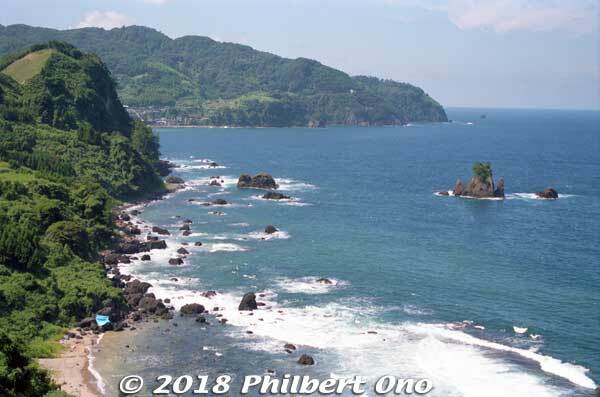 For a few days in October 2018, I visited most of the major sights in northern Kyoto Prefecture and really enjoyed Kyoto away from the city of Kyoto. Above is a map of Kyoto Prefecture’s municipalities. Shaded in aqua are the seven municipalities in northern Kyoto Prefecture that banded together under the “Kyoto by the Sea” theme: Ayabe, Fukuchiyama, Ine, Kyotango, Maizuru, Miyazu, and Yosano (綾部市、福知山市、伊根町、京丹後市、舞鶴市、宮津市、与謝野町). The city of Kyoto is in yellow. Northern Kyoto is about 2 hours north of JR Osaka Station and Kyoto Station via express train. Main gateway stations are Fukuchiyama and Amanohashidate Stations. The private Kyoto Tango Railway is the main train network in Kyoto by the Sea. Kyoto Prefecture also has at least two other tourism PR themes: “Kyoto in the Forests” (森の京都) and “Kyoto Infused with Tea” (お茶の京都). They are outside the tourist-crowded city of Kyoto. The areas outside Kyoto city have a tougher time to attract tourists since most tourists just stay in the city of Kyoto. So it’s a good strategy to promote tourism collectively in each region outside Kyoto city. 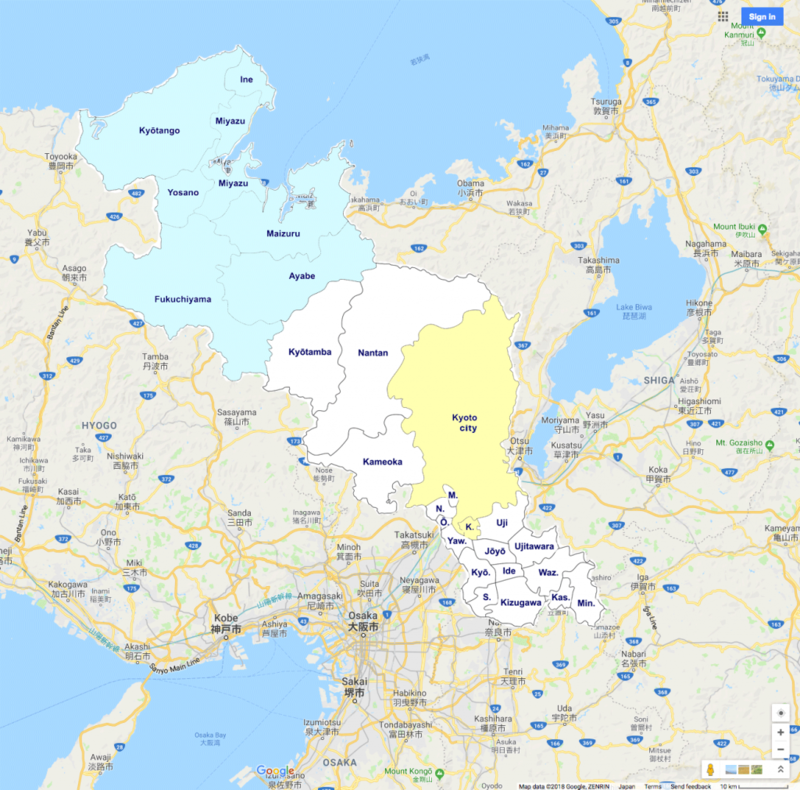 For multiple municipalities to band together to promote their region under a central theme is still kind of rare in Japan. Hope they will be able to attract more tourists and relieve the crowds in Kyoto city. 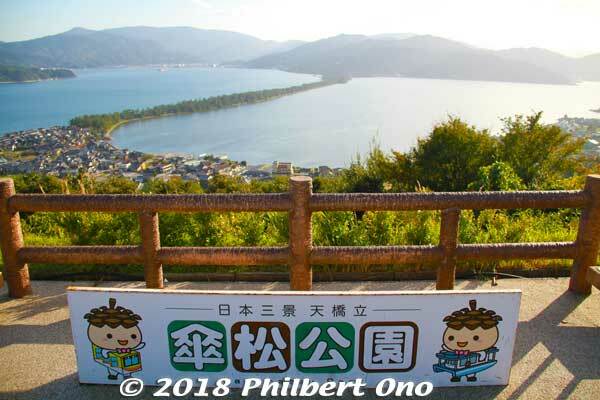 Near the entrance to Amanohashidate, this welcome sign with “One of the three famous beauty spots of Japan” has been here for decades. 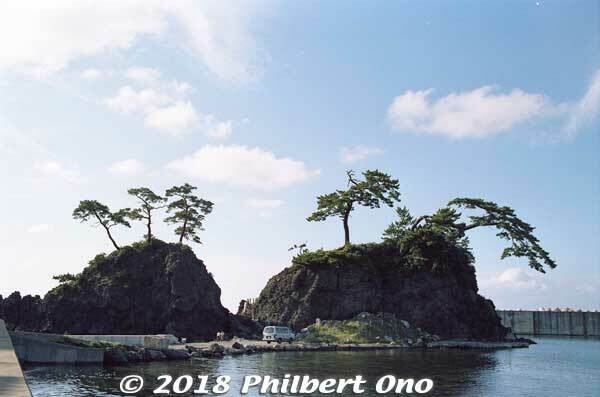 The other two Scenic Trio sites are Miyajima (vermillion torii and shrine on the ocean) in Hiroshima Prefecture and Matsushima (pine tree islands) near Sendai, Miyagi Prefecture. According to Japanese Wikipedia, Nihon Sankei originated in 1643 by Hayashi Gaho (aka Hayashi Shunsai), a Japanese Neo-Confucian scholar who wrote a book mentioning these three sights. The expression “Nihon Sankei” was later coined in 1689 by another Japanese Neo-Confucianist scholar, Kaibara Ekken in his travel diary. So “Nihon Sankei” goes way back to the 17th century. To the question of why the best always comes in threes, the answer seems to be more complicated. It seems the Japanese have had favorite numbers for many centuries. Many odd numbers are favored including one, three, five, and seven. This might sound familiar when you think about haiku and tanka poetry syllables, and the 7-5-3 (shichi-go-san) coming-of-age celebration for kids. But the number “three” for “Best Three” or “Big Three” has also stuck for centuries and still today. Amanohashidate as seen on the southern end. In the distance is Tango Peninsula up north. 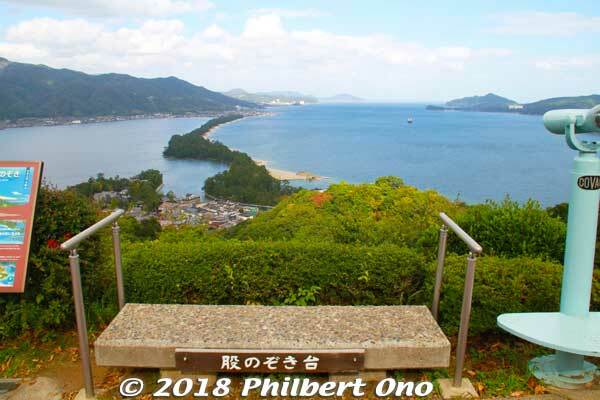 The thing about Amanohashidate is that it looks very different from different lookout points. 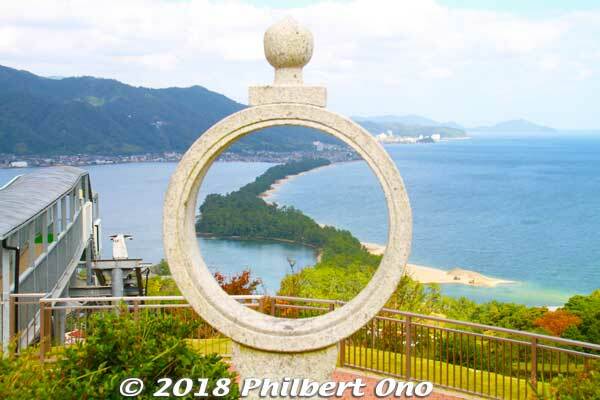 The most popular spots to view Amanohashidate are on the hilltop on the southern and northern ends. If you have time, I highly recommend that you see it from both the southern end and northern ends. Which means you should rent a bicycle and ride across Amanohashidate which I also highly recommend. As seen from the southern end above, the left side is the west side with an enclosed, but connected ocean named Asoumi Sea. The right side is the east side with white-sand beaches facing the open ocean. Ships can still go through both sides of the sandbar through a narrow strait on the southern end. On the lower right of the sandbar, notice the finger of sand extending into the ocean. This finger keeps growing as the northern sand erodes and drifts south to the finger. So every few years, they have to remove the excess sand. (Notice the power shovel and dump truck working on it.) Otherwise, this little sand spit will become another sandbar across the ocean, impeding local shipping. 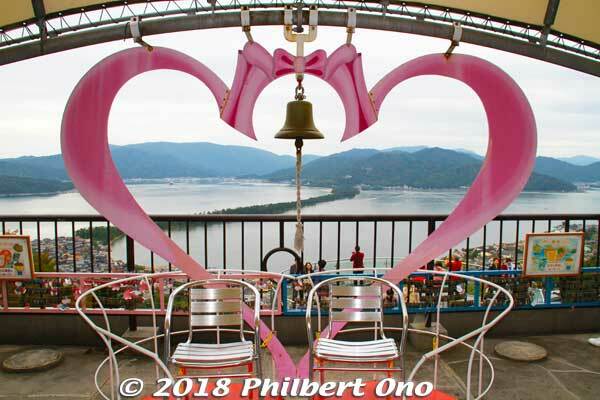 The hilltop on the southern end has a small amusement park called Amanohashidate Viewland easily accessible via chair lift or cable car, and a short walk from Amanohashidate Station﻿. 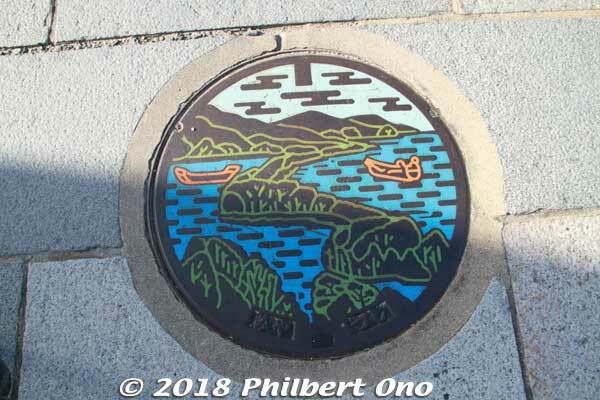 Amanohashidate manhole is based on the view from the southern end. 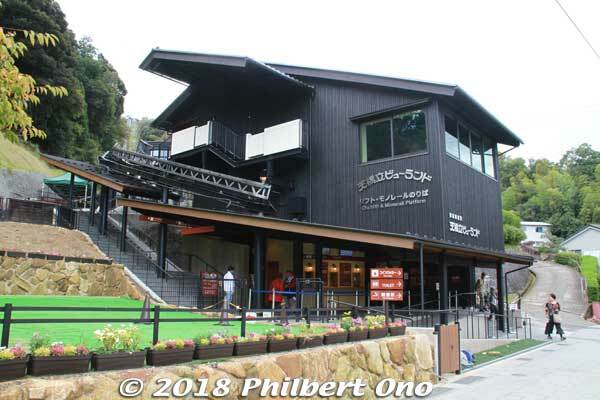 Chair lift and cable car station for Amanohashidate Viewland. Short walk from Amanohashidate Station. 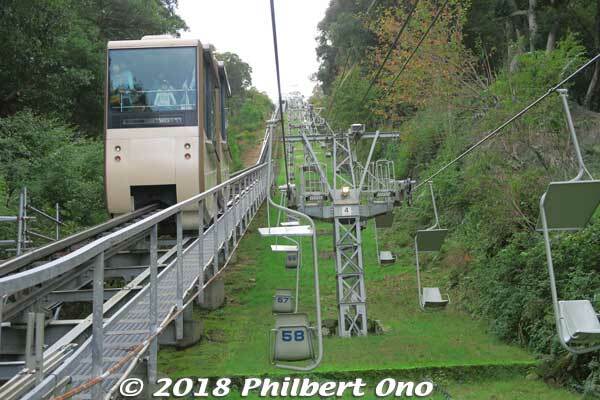 Chair lift and monorail car for Amanohashidate Viewland. Taking the chair lift is faster than the monorail car. 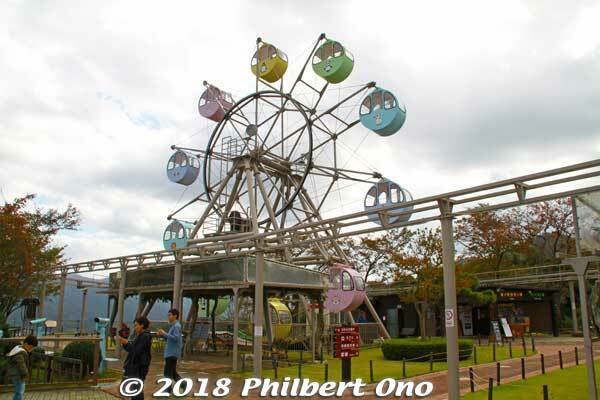 Small ferris wheel at Amanohashidate Viewland. 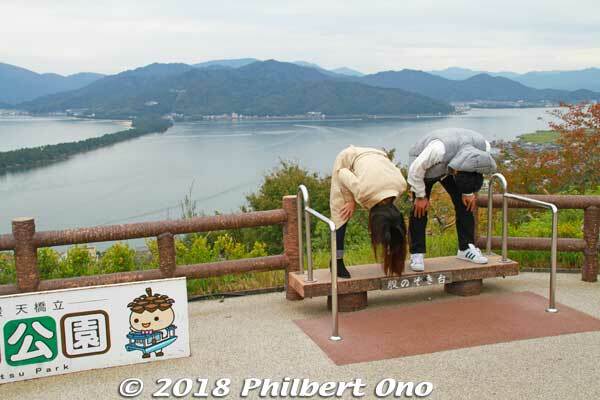 Amanohashidate lookout points have platforms where you supposed to view the sandbar upside down. 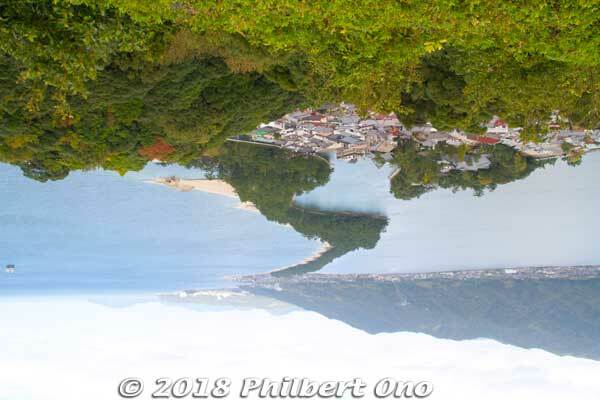 On the southern end here, Amanohashidate upside down does look like a flying dragon (hiryu 飛竜). That’s the dragon’s head in the front and the slim tail in the back. When you see it upside down, the sandbar/dragon is in the sky right? Amanohashidate also has these “Circle of Wisdom” everywhere. To gain wisdom, you supposed to crawl or look through it three times or buy and throw three small clay dishes through it. Tourist gimmick. Chionji Temple’s Sanmon Gate, National Important Cultural Property. Before crossing Amanohashidate, stop by Chionji Temple (智恩寺) next to Amanohashidate’s southern entrance. With the imposing Sanmon Gate, you can’t miss it. Belonging to the Rinzai Zen Sect, Chionji worships the Manjushri bodhisattva (Monju Bosatsu) for wisdom and academic abilities. Many students pray here. 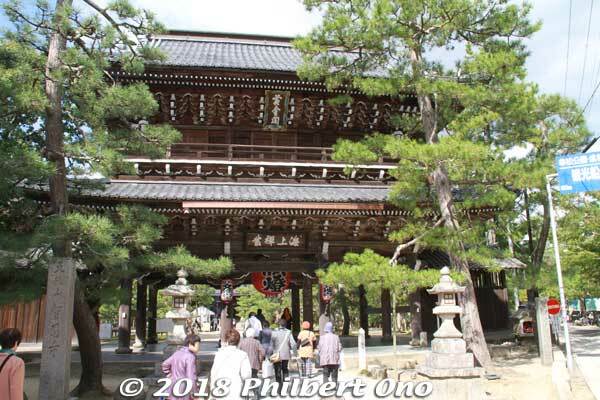 The temple is not affiliated with Chion-in Temple in Kyoto city. 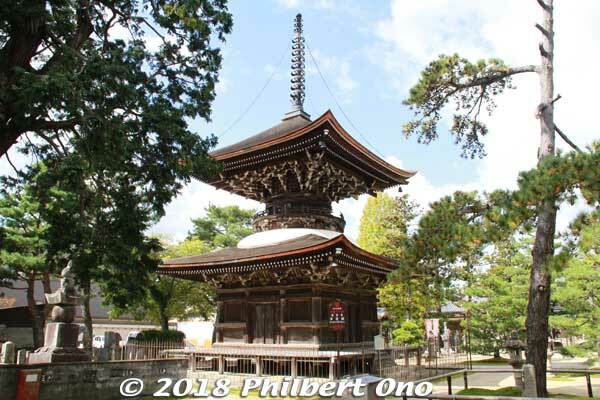 The temple’s beautiful Tahoto Pagoda with a round upper story and square lower story. It contains objects of worship. Next to Chionji Temple is this Circle of Wisdom Lantern (智恵の輪 灯籠). No longer a lantern to guide ships, but this is the original Circle of Wisdom in Amanohashidate that has been copied everywhere. Across the water is the Amanohashidate sandbar. On the southern end, this bridge to Amanohashidate rotates quite often to allow boats to pass. 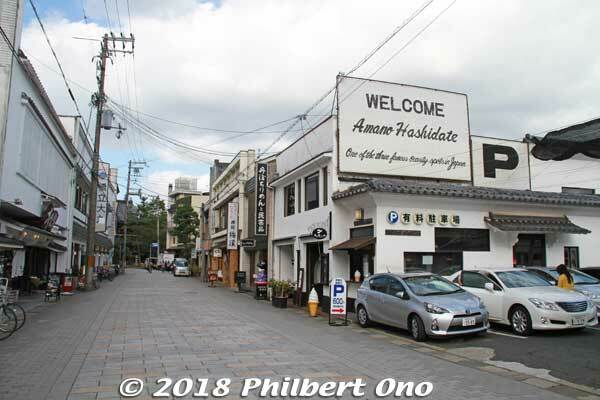 If you have time, rent a bicycle and cycle across Amanohashidate to the northern end. 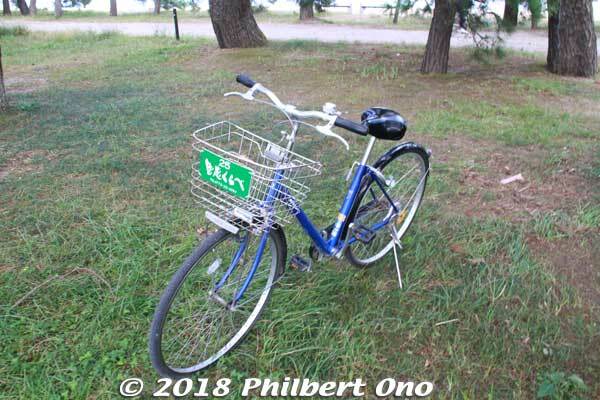 I rented a bicycle in front of Amanohashidate Station. 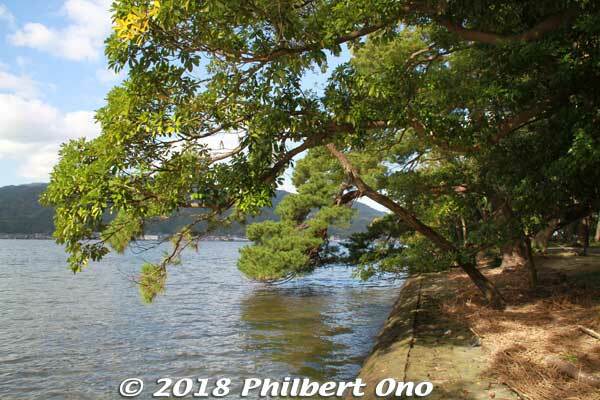 Cycling on Amanohashidate through thousands of Japanese pine trees. 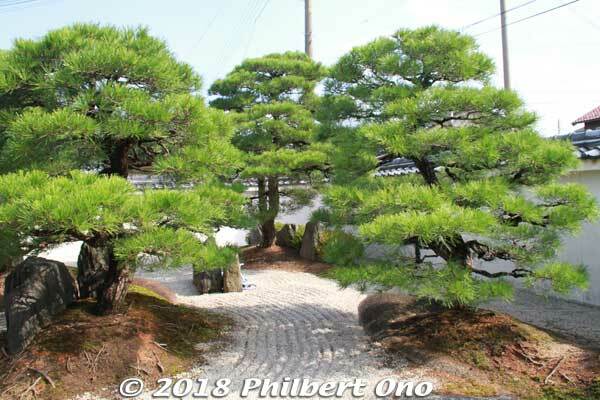 Wedded pine trees (夫婦松) on Amanohashidate. It takes about 15 min. to cross Amanohashidate by bicycle without stopping. But there are a number of monuments, a shrine, pine trees, and sandy beaches to photograph along the way. So it took me 30-40 min. to cross. 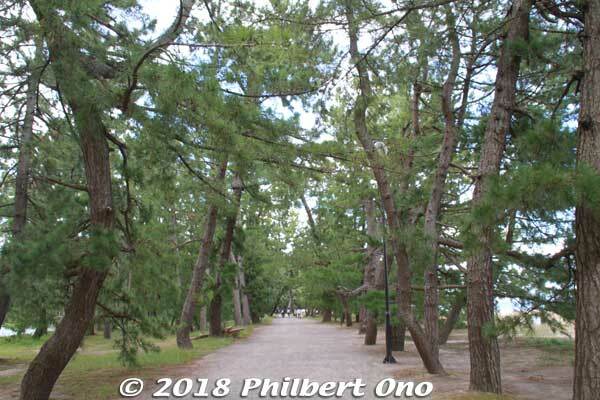 Amanohashidate has wedded pine trees (夫婦松) and other fantastically-shaped pine trees and commemorative pine trees (planted by so-and-so emperor, etc.). West side of Amanohashidate with no beaches. East side of Amanohashidate with beaches. 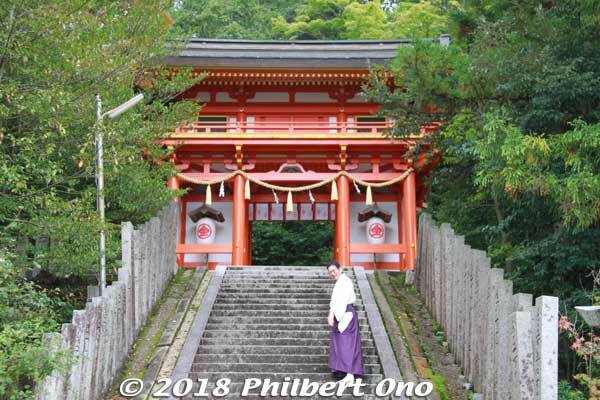 Moto-Ise Kono Shrine (photography not allowed beyond this torii). 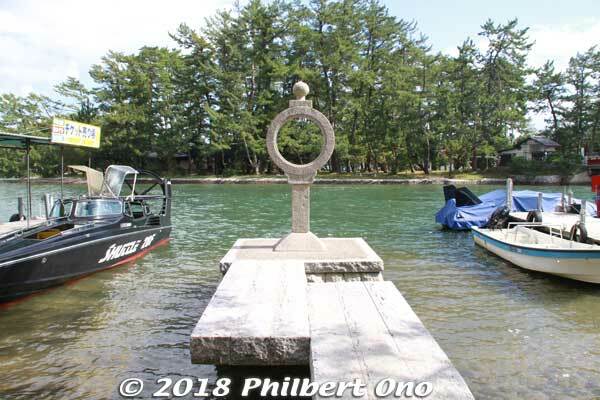 After crossing the sandbar, visit Moto-Ise Kono Shrine (元伊勢籠神社). To understand this shrine, you need to know about Ise Grand Shrines (Ise Jingu) in Mie Prefecture, Japan’s most sacred Shinto shrines. They are dedicated to the Sun Goddess Amaterasu (Shinto’s most important goddess and legendary ancestor of the Imperial family) and Toyouke-Omikami (豊受大神), goddess of agriculture. 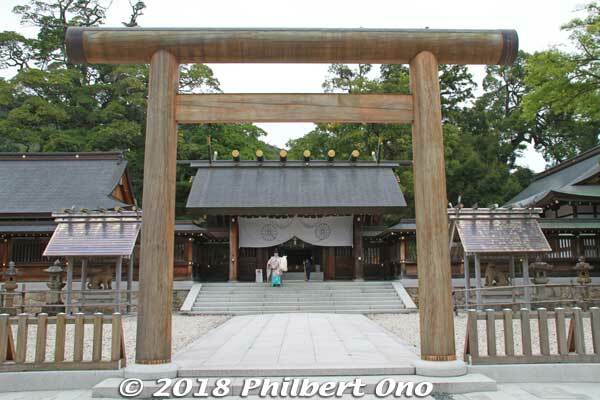 Before Ise Jingu was established around the 7th century (or earlier), a number of shrines for these two deities were temporarily or permanently established in various locations including this Kono Shrine. 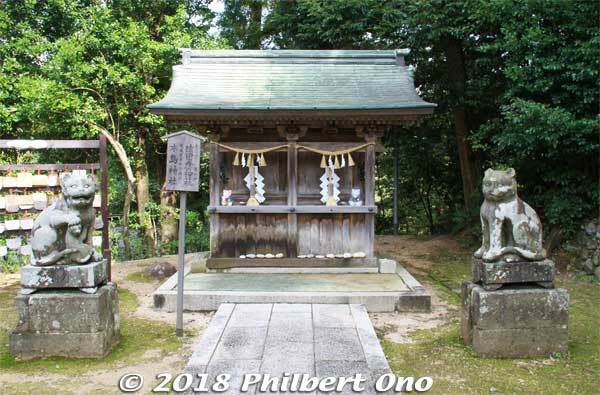 These pre-Ise Jingu shrines are prefixed with “Moto-Ise.” Moto-Ise Kono Shrine worships five gods and one of them is Toyouke-Omikami (豊受大神), the same goddess of agriculture worshiped in Ise. The shrine is open 7:00 am to 5:00 pm. Free admission. 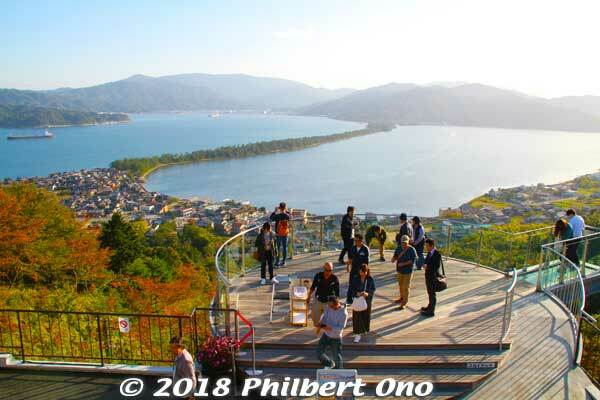 The shrine is near the chair lift and cable car station (Fuchu Station) for the hilltop Kasamatsu Park (see below) for fine views of Amanohashidate from the northern end. By bus: At Amanohashidate Station (Kyoto Tango Railway), take a local bus bound for Ine, Kamanyu, or Kyogamisaki ([伊根・亀島] [蒲入] [経ヶ岬]) and get off at Jinja-mae stop. Parking also available. By bicycle: Bicycles can be rented at a souvenir shop In front of Amanohashidate Station and at the entrance of Amanohashidate sandbar. Bicycle across Amanohashidate to the other end. Otherwise, walking from Amanohashidate Station will take at least 45 min. 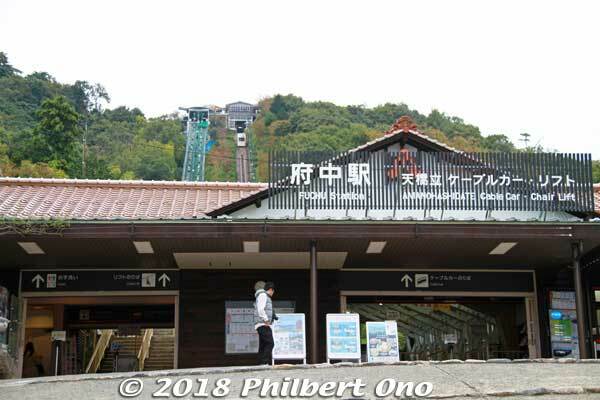 Fuchu Station, a chair lift/cable car station to go up to Kasamatsu Park on a hill on the northern end of Amanohashidate. Chair lift to Kasamatsu Park. They keep telling you not to jump off even if you dropped something. They also have a cable car if you’re afraid of heights. Amanohashidate as seen from the northern end atop Kasamatsu Park. Look at it upside down. 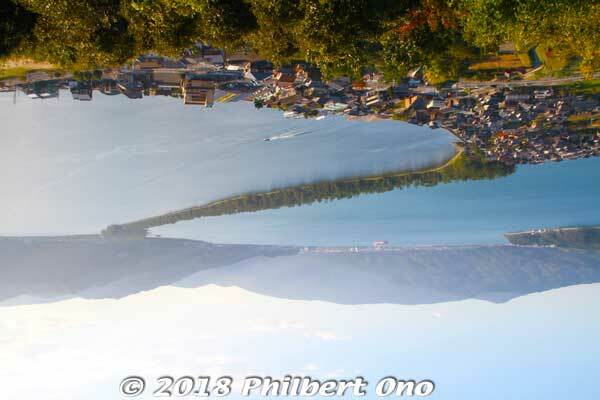 Upside down from the northern end, Amanohashidate supposed to look like a bridge to heaven. 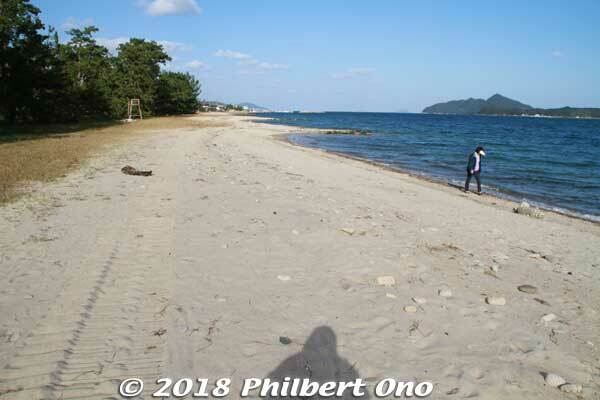 Amanohashidate is a sandbar created since thousands of years ago by opposing ocean currents carrying sand. 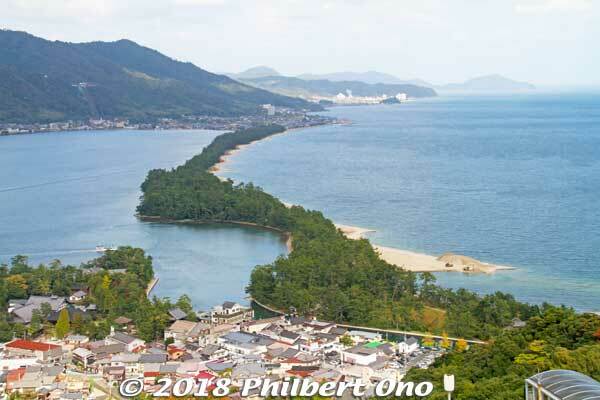 But according to Japanese mythology, Amanohashidate was created during the divine Age of Gods (before man appeared). The great creator god Izanagi in Heaven, built a long floating ladder-bridge from Heaven to Earth so he could see his wife (younger sister) the goddess Izanami who was living at Moto-Ise Kono Shrine on Earth. However, in a single night while he was asleep, the bridge collapsed and fell to Earth, where Amanohashidate is today. 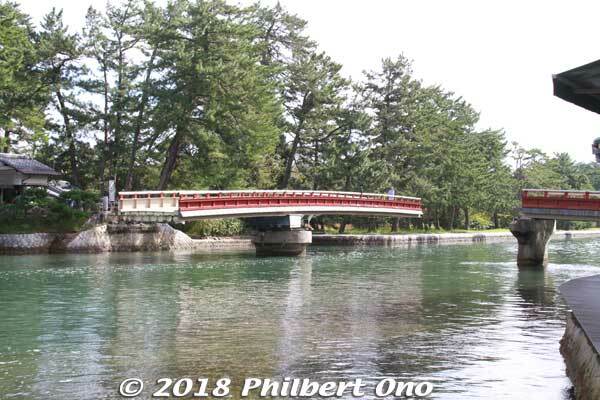 And so if you view it upside down at Kasamatsu Park, it’s supposed to look like a bridge to/from heaven which is what “Amanohashidate” (天橋立) means. And so Amanohashidate symbolizes a link between Heaven and Earth and between two lovers. 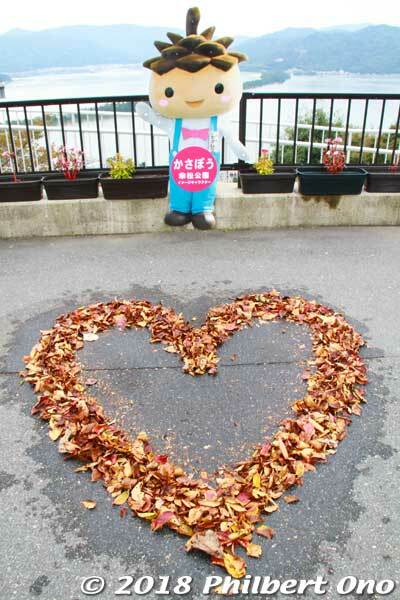 That’s why you may also see heart or love symbols at Amanohashidate. 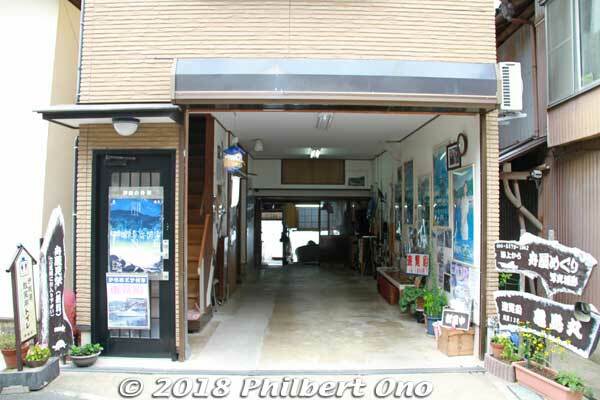 By bicycle: Bicycles can be rented at a souvenir shop in front of Amanohashidate Station and at the entrance of Amanohashidate sandbar. Bicycle across Amanohashidate to the other end. Otherwise, walking from Amanohashidate Station will take at least 55 min. 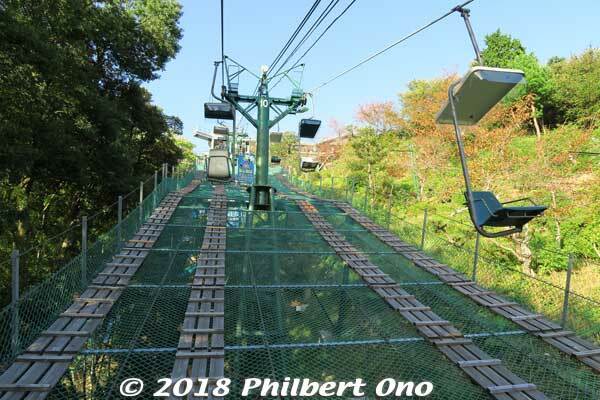 Take the chair lift or cable car to go up to Kasamatsu Park. Round trip: ¥660 for adults, ¥330 for kids (age 6 to 11). Price is the same whether you take the cable car or chair lift. 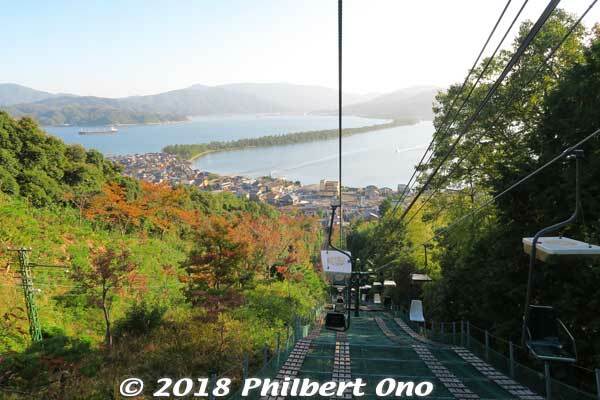 Chair lift down from Kasamatsu Park has nice views. Amanohashidate is thus the symbol of northern Kyoto and Kyoto by the Sea. It’s less crowded, slow-paced, and very scenic. One of Japan’s Big Three Sceneries, Best Three Picturesque Views, Big Three Sights, or Scenic Trio. Whatever you call it, it’s famous in Japan. At Fukuchiyama Station, “Aomatsu” cafe train to Amanohashidate. Express trains (tokkyu) from JR Osaka Station and JR Kyoto Station take 2 to 3 hours to reach northern Kyoto’s gateway train stations at Fukuchiyama, Miyazu, and Amanohashidate Stations. A few early morning trains go directly from Osaka/Kyoto to Amanohashidate. Other express trains will require you to transfer trains at Fukuchiyama or Miyazu Station to reach Amanohashidate Station. Fukuchiyama Station connects to the private Kyoto Tango Railway and JR San’in Line. Kyoto Tango Railway (Kyoto Tango Tetsudo 京都丹後鉄道) is the main train network in northern Kyoto. (JR Railpass is not accepted.) Many places of interest are near a Kyoto Tango Railway train station. The trains usually have only one to three cars. From Fukuchiyama, you can get to Maizuru, Miyazu, Amanohashidate, and even Toyooka in Hyogo Prefecture. If you plan to ride Kyoto Tango Railways for a long distance, the one-day train pass is a good deal. Kyoto Tango Railway is operated by Willer Trains, a subsidiary of Willer Express that operates long-distance buses in Japan. At Fukuchiyama Station, Kyoto Tango Railways operates a special tourist train named “Aomatsu” to Amanohashidate. It’s just one train car with a striking, wood-themed interior design. The floor and seat are made of wood. It has a bar for refreshments and a waitress. 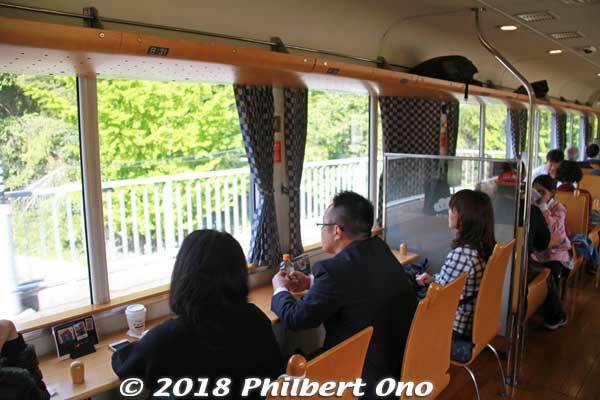 It’s a cafe train that serves drinks and light meals. 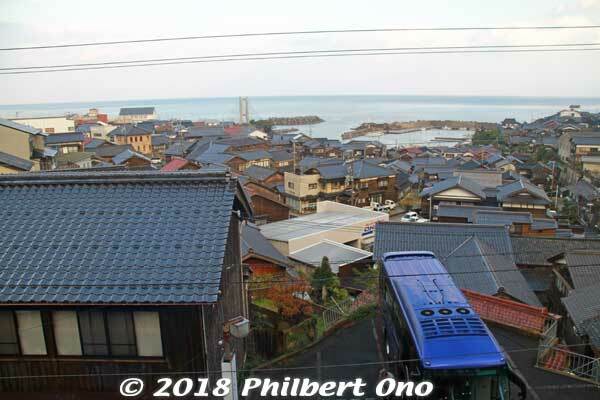 As of this writing, the Aomatsu train runs once every morning (10:17 am) and afternoon (3:17 pm) from Fukuchiyama Station to Amanohashidate Station and requires no reservations nor extra train fare. Non-reserved seating. Aomatsu has a variety of seating arrangements like sofas, counter seating, and table seating (train fare is the same for all seats). Picture window counter seats on Aomatsu train. Cafe-type seats (wooden) with a table in the Aomatsu train. 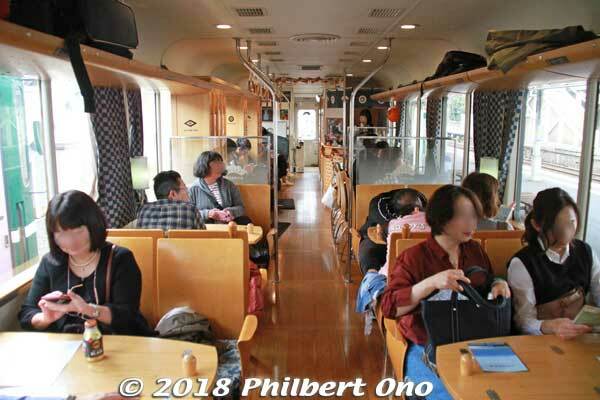 Kyoto Tango Railway has another cafe train named “Akamatsu” that runs twice a day (except on Tue. and Wed.) between Nishi-Maizuru and Amanohashidate. But this train requires reservations. The Aomatsu, Kuromatsu, and Akamatsu trains were designed by Mitooka Eiji (水戸岡鋭治), a renown designer of many luxury trains especially for JR Kyushu. Ine in northern Kyoto Prefecture. After Amanohashidate, the next must-see place is Tango Peninsula, the main part of Kyoto by the Sea (northern Kyoto). On the east coast of the peninsula is Ine (伊根), a picturesque fishing village right on the water’s edge. 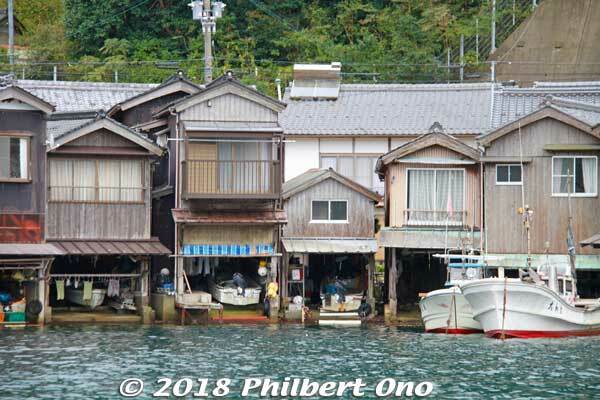 The waterfront homes are unique for having built-in funaya “boat garages” (舟屋) to keep a boat next to the water. The Ine waterfront has looked like this since the 1930s when they reclaimed some of the coastline, and fishermen rebuilt their homes right over the water. 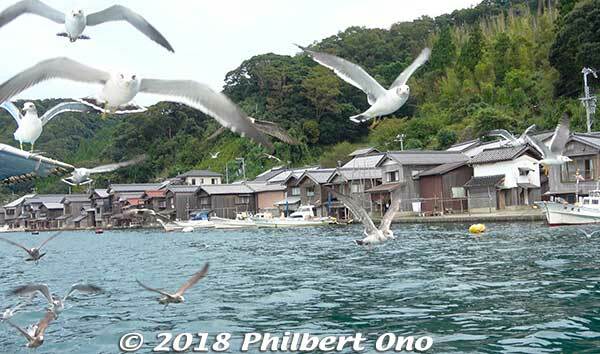 This village is designated as an Important Traditional Townscape Preservation District of Japan (重要伝統的建造物 群保存地区) and Japan’s first fishing village to be so designated. Ine has been used as a backdrop in Japanese movies like Tora-san movie No. 29 (1982) and Tsuribaka Nisshi movie No. 5. You may think these homes are sitting ducks for high waves, typhoons, high tides, etc. 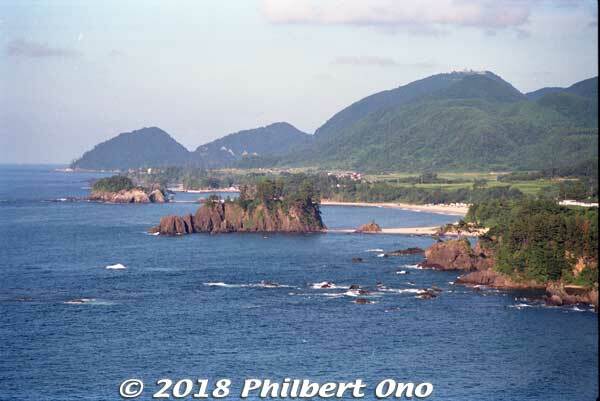 But they are in a sheltered bay facing south, away from the Sea of Japan. Mountains shield the bay on three sides and a small island (Aoshima) on the bay’s entrance acts like a breakwater. 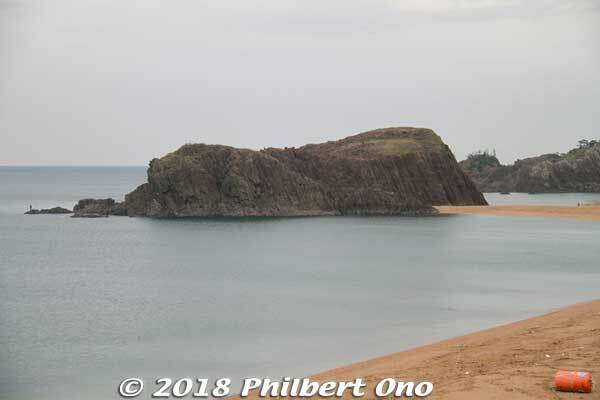 Ine Bay is thereby largely untouched by the rough seas of the Sea of Japan and the water is very calm. Also, the ocean tide varies by only 50 cm at most. Kameshima Maru “sea taxi” for seeing the boat houses. Seagulls expect to be fed by boat tourists. We even got free bird food. But I feared the droppings on me or my camera. A great way to see the Ine boat houses is by boat (called “sea taxi”). 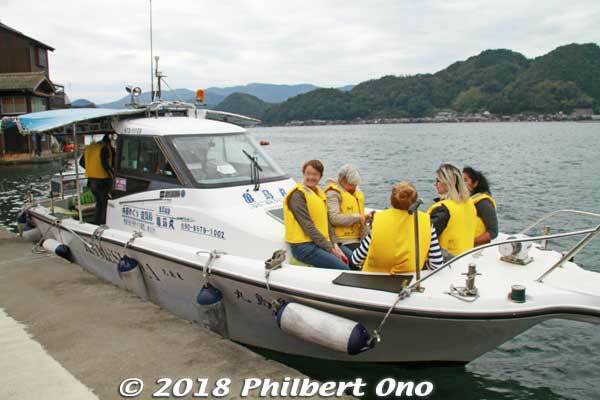 Small boats offer 30-min tours for only ¥1,000 per person. Our boat, seating 12 people, was the Kameshima Maru (亀島丸) operated by Toshikazu Yamada. 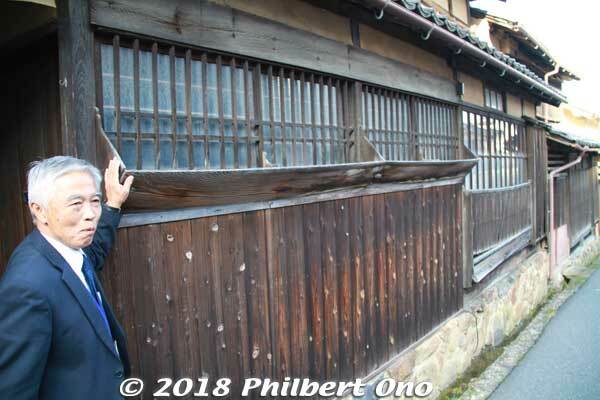 He pointed out the boat houses and locations used in Japanese movies. Kameshima Maru boat cruises has no cruise schedule so you can just call and set a time for a cruise. There must be at least two people for a cruise to depart. Main homes on the left, boat houses on the right. After the boat cruise, we had a guided walking tour of Ine village. 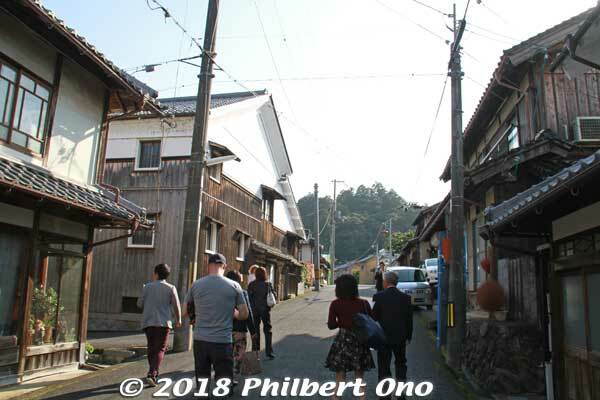 Behind the funaya boat houses is this narrow coastal road and another row of homes across the road on the left at the foot of the hills. The homes along the left are the main homes where the fishermen’s family live. 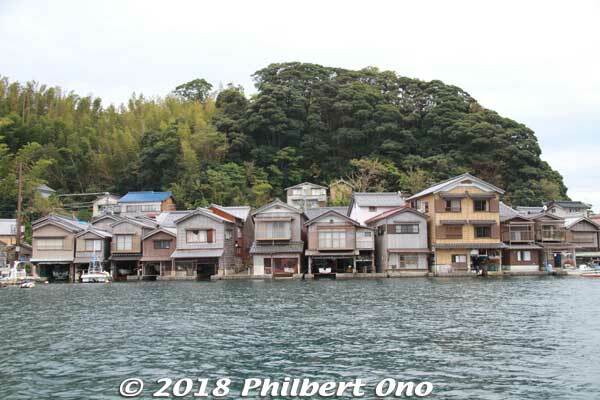 And their funaya boat houses are right across the road on the right. Car garage and waterfront boat garage. 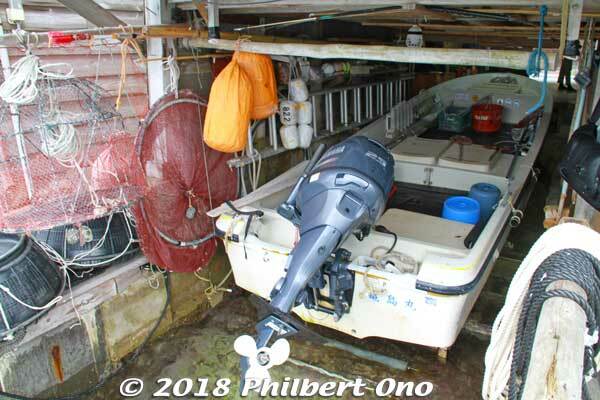 Above is the boat house of Mr. and Mrs. Toshikazu Yamada (山田 敏和), a very friendly fishermen couple who runs Ine boat cruises and work as fishermen. This is what a funaya boat house looks like from the road. The boat house is not that big. It’s usually used as a second house for retired grandparents or for a young married couple who want some privacy. Or it can be used as a workplace, a guesthouse, or inn. First you see a normal car garage. Enter the car garage and walk toward the back to see another room. In the back of the car garage is the boat garage on the water’s edge. The small fishing boat is hoisted and secured by a power winch. Above the boat is just storage space (not another room). The family uses the boat to catch fish for themselves. These boat garages were originally built to protect the boat from the elements. In the old days, boats were made of wood. They did not have a waterproof deck like modern boats do today. So the boat garage protected the boat from rain. 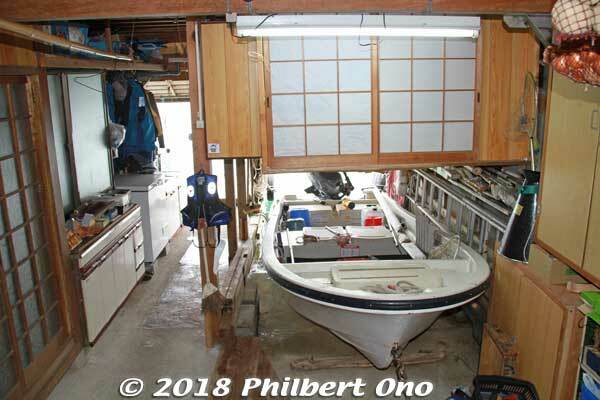 The boat was also hoisted to dry in the garage. Since seawater tended to rot wood, drying the boat when not in use would make the boat last longer. I asked about how it was during the recent typhoons in fall 2018. Mrs. Yamada said that the secured boat shook a lot, but there was no damage. Mrs. Yamada catches captive fish to show us. 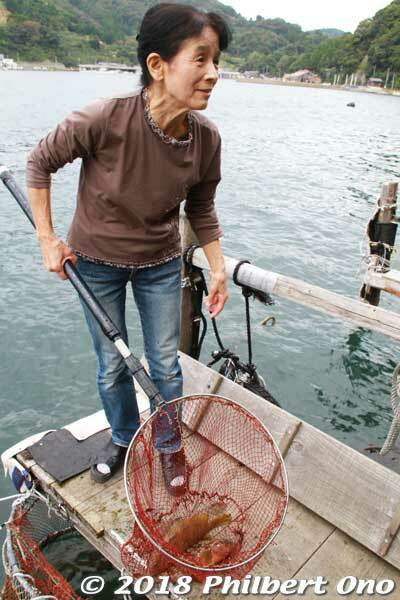 Mrs. Yamada also raises fish under their small dock. I asked what kind of fish, and she caught two to show us. 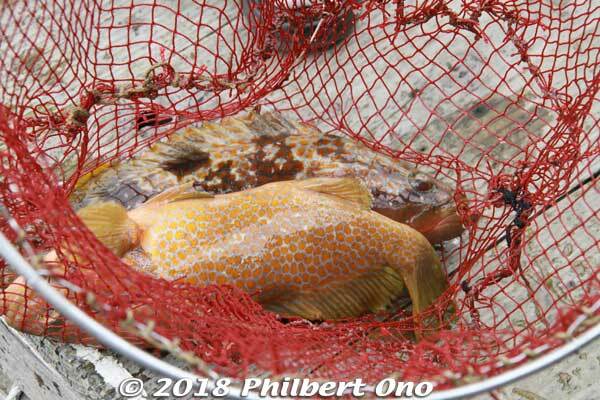 They were Redspotted Grouper (アコウ、キジハタ), a luxury fish delicious as sashimi. They were feeding these fish until they get big enough for eating. Further down along Ine Bay are a few more tourist spots. Ine Tourist Information Center on the 1st floor and Funaya Shokudo restaurant (舟屋食堂) on the second floor where we had lunch. Ine Tourist Information Center on the 1st floor. 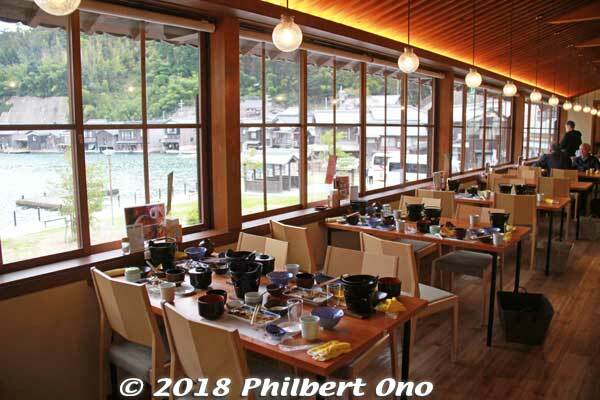 Funaya Shokudo restaurant with a nice view of the waterfront on Ine Bay. 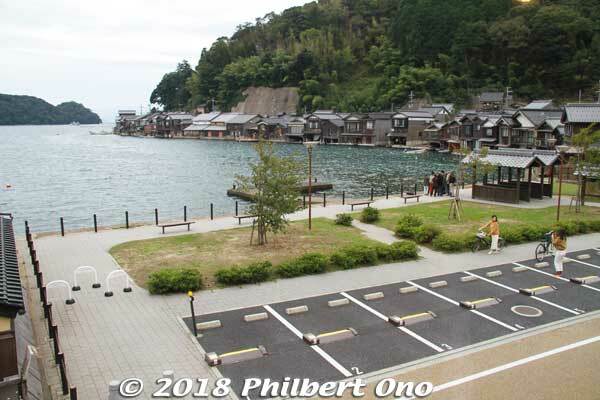 From the restaurant, nice view of the small waterfront Ineura Park (伊根浦公園) on Ine Bay. We had the Funaya Teishoku for lunch mostly seafood, ¥2,000. 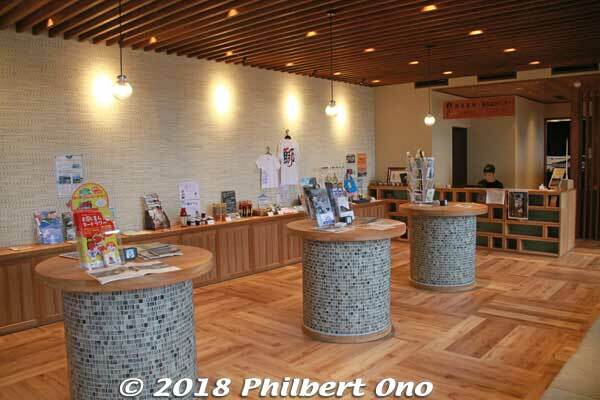 Mukai Shuzo Sake Brewery’s gift shop. 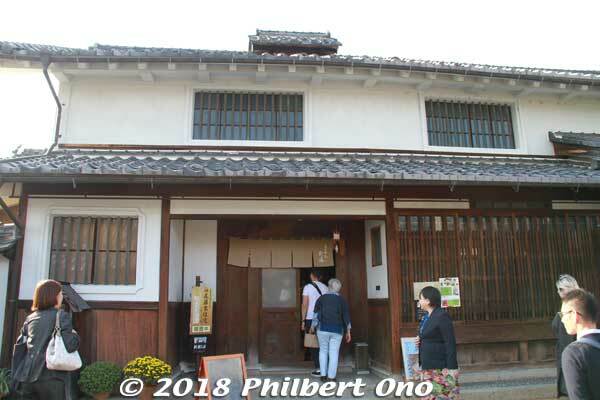 Ine also had a sake brewery called Mukai Shuzo Sake Brewery (向井酒造株式会社) established in 1754. We didn’t tour the brewery. Just went to their gift shop and sampled their stuff. Their main sake brand is called Kyo-no-Haru (京の春). Nice big Japanese evergreen tree outside, 300 years old. The brewery’s chief brewer is Mukai Kuniko (向井 久仁子) born in 1975 in Ine. She graduated from an agricultural college in Tokyo and took over from her dad. Her younger brother is the president of the company. 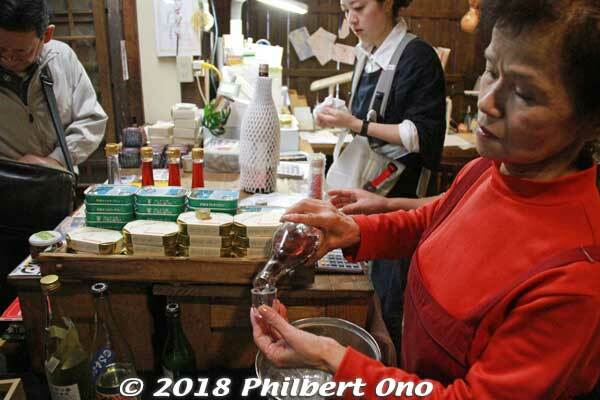 Tasting some sake and other drinks at Mukai Shuzo Sake Brewery. Closest train stations are Amanohashidate Station and Miyazu Station both on the Kyoto Tango Railway. From JR Kyoto and JR Osaka Stations, there are trains that go directly to Amanohashidate and Miyazu Stations. Tango Peninsula, northern Kyoto Prefecture. On a map, Tango Peninsula (Tango Hanto 丹後半島) in northern Kyoto Prefecture looks like a short thumb sticking into the Sea of Japan. Some parts of the coast are quite dramatic or scenic as I found out when I once bicycled around it years ago. 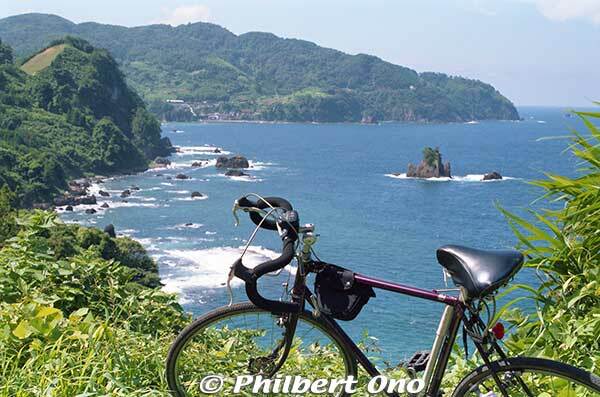 It took a day, and it’s much easier to enjoy the coastal scenery on a bicycle than from a bus. It’s a rural area so the cars are few. 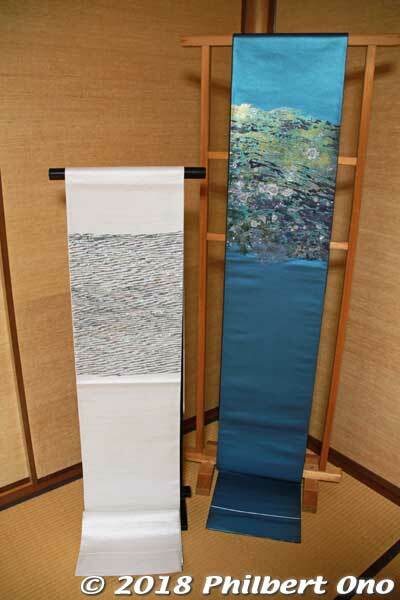 Tango Peninsula is also famous for Tango chirimen silk crepe fabrics used in high-end kimono and obi sashes (丹後ちりめん). Mention “Tango” to the average Japanese, and they most likely will answer “chirimen?” Tango Peninsula is synonymous with chirimen silk fabrics made here since 300 years ago. 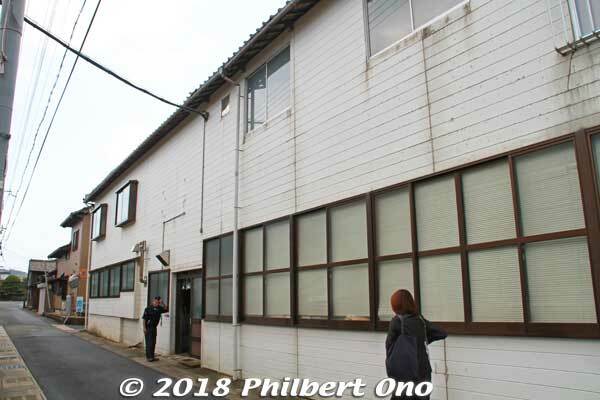 In Oct. 2018, I revisited Tango Peninsula to visit chirimen factories. Tango Peninsula has the city of Kyotango and the towns of Ine and Yosano. When you tour the Tango area, you may hear about the big Kita-Tango Earthquake (北丹後地震) that struck the Tango area on March 7, 1927. About 70%–90% of buildings in Mineyama, Kyotango, and Yosano were destroyed by the quake or resulting fire. In Mineyama, 97% of buildings were destroyed and 22% of the population died. In Kyoto Prefecture, a total of 2,898 died and 7,806 injured. *Note that “Tango” in this case is not pronounced like the tango dance. In Japanese, the “Tan” is pronounced more like “ton” or “tongue” in English. Cycling around Tango Peninsula with my bicycle. One of the most dramatic coasts of Tango Peninsula. 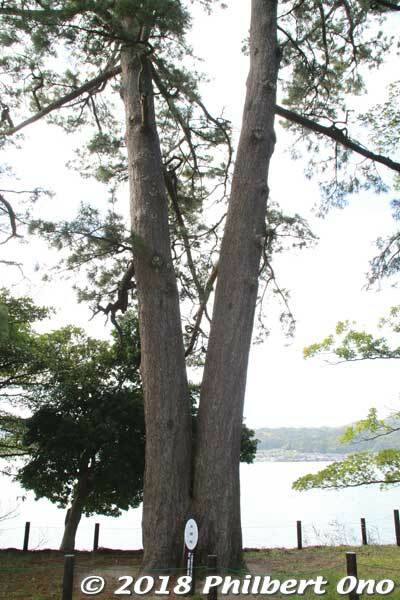 Tango Matsushima (pine tree islands). Tateiwa Rock near a swimming beach called Tateiwa Nochigahama (立岩後ヶ浜海水浴場). Western Tango Peninsula is part of the San’in Kaigan Geopark (山陰海岸ジオパーク) that extends from the western half of Tango Peninsula (Kyotango) to Tottori Prefecture. San’in Kaigan Geopark is also a UNESCO Global Geopark. 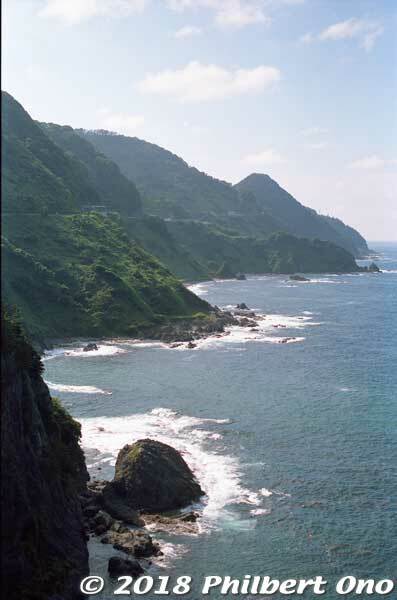 This part of Japan is geologically important because it has remnants of when Japan broke away from the Asian mainland. So Tango has something for geologists too. Notable natural formations include Byobu Iwa Rock which is a partition-like rock jutting out of the ocean and Tateiwa Rock. 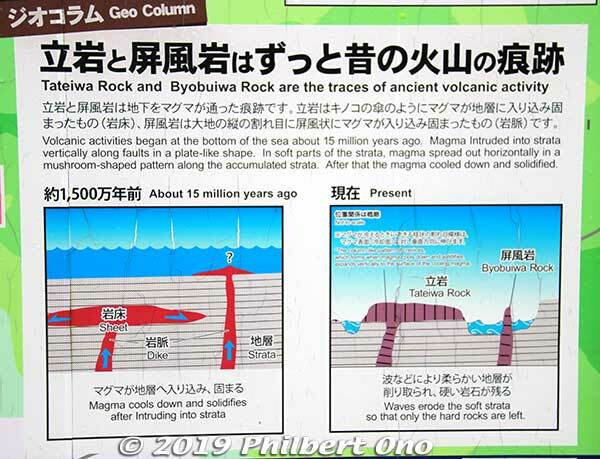 How Byobu Iwa and Tateiwa Rock formed. Tateiwa Rock (“Standing Rock”) originally was a mass of magma that erupted and accumulated within the earthen strata below the surface. The magma didn’t break the surface. However, the surrounding strata was soft and eventually eroded to expose only this hard volcanic rock called “Tateiwa” (Standing Rock). It looks like slanted columns of rock fused together. While cycling around Tango Peninsula years ago, I often heard the mechanical sounds of looms here and there. There are fewer of them now though. The Tango region’s rainy and humid climate is ideal for chirimen production since silk does not work well in dry climates. So there are (or were) many chirimen factories (including mom-and-pop operations) here. “Chirimen” (縮緬) literally means “shrunken or crimped fabric.” In the West, we call it “crepe fabric.” So it has a wrinkly or bumpy surface. We visited a few chirimen factories in Tango and talked to a few of the top people in the industry. We were very impressed by the fabric’s extremely high quality and their use around the world by major fashion brands. At Tamiya Raden, kimono with shell inlay. Tamiya Raden (民谷螺鈿) had this stunning silk kimono on display for us. Raden means inlay (using shell, ivory, etc.). Typically, we think of lacquerware, but they do it on fabrics. The above kimono took 2.5 years to make and is worth more than a Lamborghini or Rolls Royce. Tamiya Kyoji explains about his masterpiece kimono. 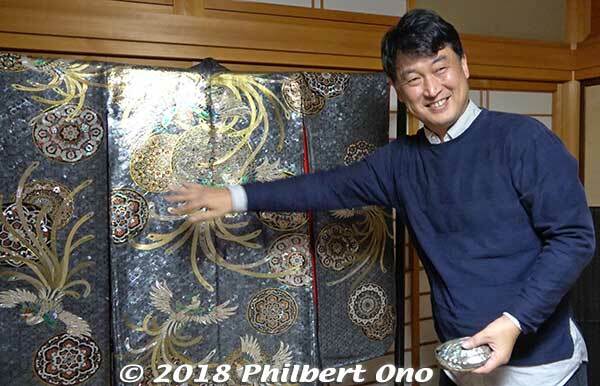 Company president Tamiya Kyoji (民谷 共路) answered our many questions about this amazing kimono. 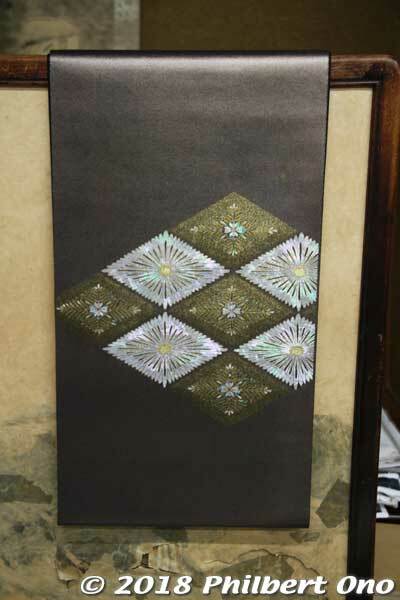 His father Tamiya Katsuichiro (民谷勝一郎) took two years to develop and invent a method to inlay shell pieces in fabrics and showed their first example on a kimono obi sash in 1977. 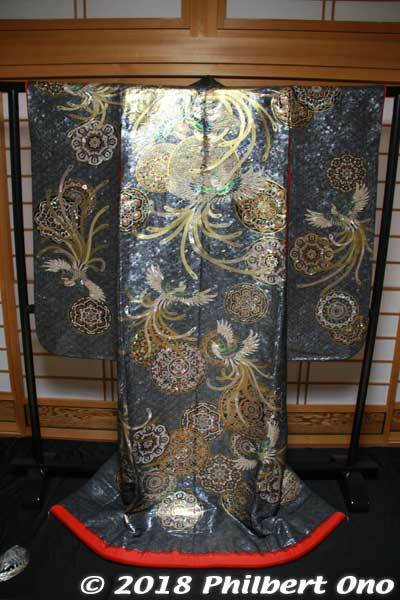 The kimono was woven with pearly shell pieces from five species of oysters. Might be hard to see which parts of the kimono are the shell inlay, but the shiny parts are not the shell pieces. Very glittery. 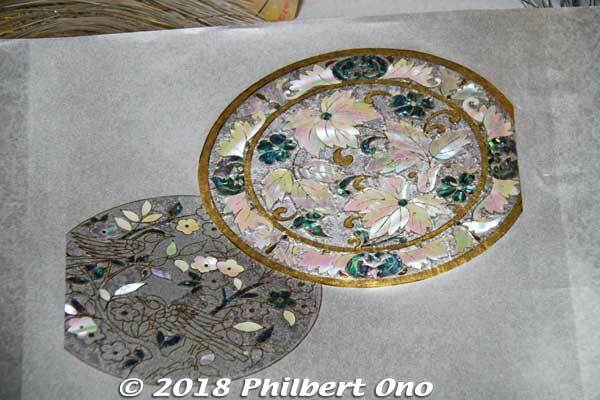 Thin shell/pearly pieces are affixed on a design on washi paper. It’s a painstaking, time-consuming process. 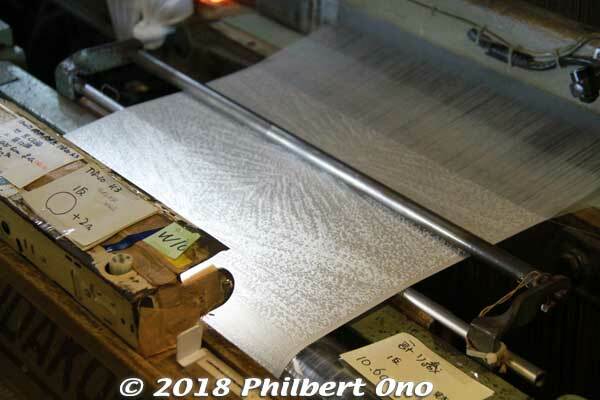 The completed design on washi paper is then sliced into “threads” that will be woven into the fabric. Tamiya Raden also makes kimono obi sashes. Working on an obi sash. Mr. Tamiya showed us a whole bunch of beautiful and innovative materials that they were working on. They also supply fabrics to world-famous luxury brands, but they can’t brag about it because of a non-disclosure agreement. Chirimen factory of Tayuh Textile Co., Ltd.
Tayuh Textile Co., Ltd. (Tayuh Kigyo 田勇機業株式会社) offers tours of their chirimen textile factory in the city of Kyotango. 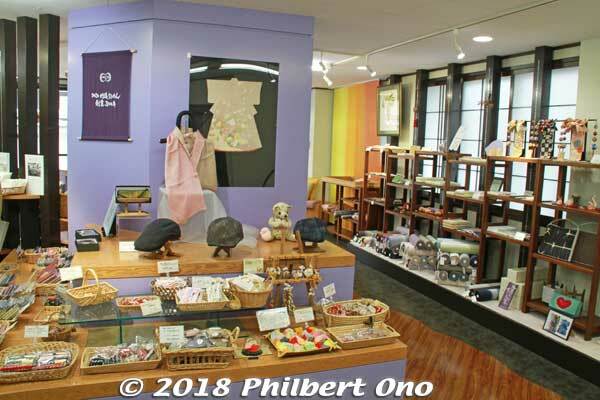 First we saw Tayuh Textile Co.’s gift shop and showroom. A wide variety of items made of chirimen. 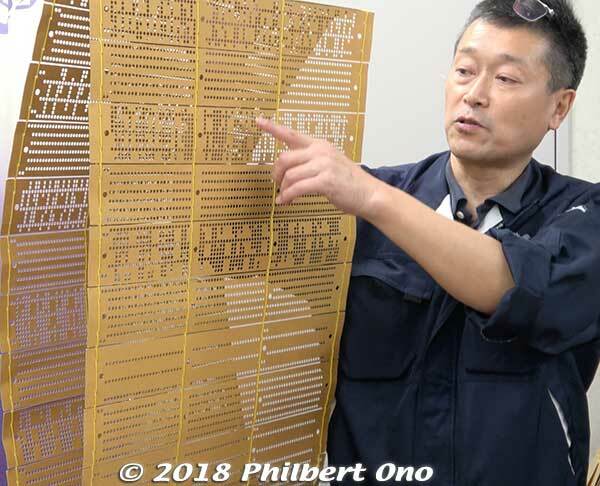 Before the factory tour, Tayuh Kigyo’s third-generation company president Tamoi Hayato (田茂井 勇人) explained about their chirimen manufacturing process. He showed us this chirimen material having a woven design. These looping punch cards called mon-gami (紋紙) program the Jacquard loom to weave the design on the fabric. The holes in the punch cards tell the loom which threads are to be raised or not during the weaving process. These punch cards can be made by computer now. 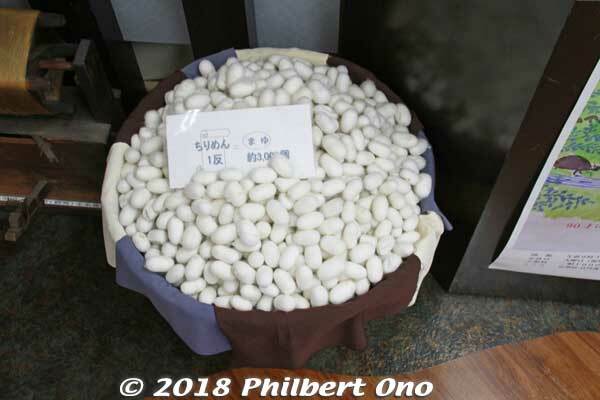 Above is 3,000 silk cocoons. That’s how much silk is needed to make the silk fabric for one kimono. One cocoon has 1200–1500 meters of silk thread. Since Japan produces very little silk, most are imported from China and Brazil. The Tango region consumes about one-third of Japan’s raw silk imports. We were told the quality of silk from China and Brazil is very good. Tayuh Textile Co. makes almost everything, from the silk threads to the fabrics. We toured their impressive factory. 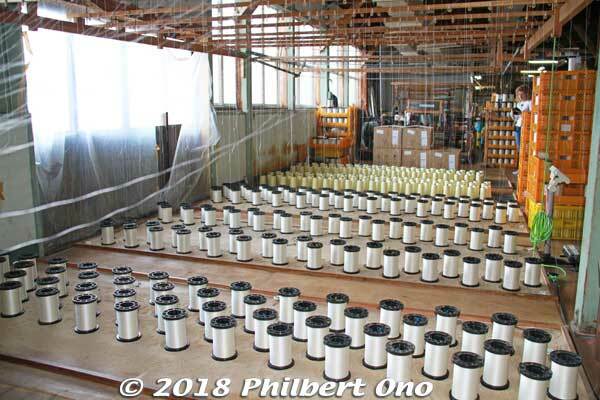 Above are spools of silk being made into threads. 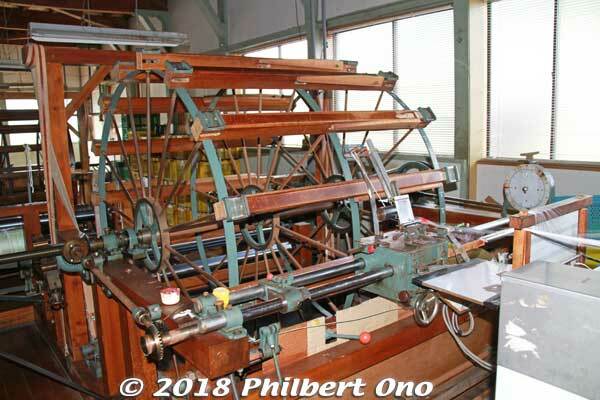 Above is a thread twister (hatchobori) to twist the horizontal silk threads (weft) 3,000 to 4,000 times. 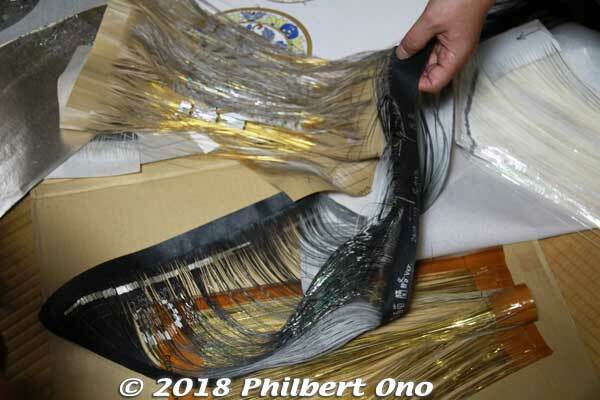 This is a key step and how chirimen gets its crimped surface. After being woven into the fabric, the highly twisted weft threads try to untwist, creating the crimping. Tayuh Kigyo’s factory has 60 mechanized looms and 50 of them are Jacquard looms. Very noisy and very fast-moving. 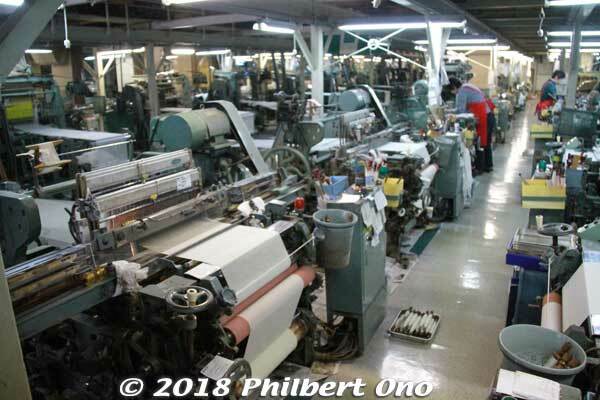 One employee monitors several looms. Mesmerizing to watch. Within Tayuh Kigyo’s factory grounds, there’s also the Garden of Hosenju (蓬仙寿の庭) designed by Shigemori Mirei (1896–1975 重森三玲), a famous Japanese garden designer. Open: 8:30–18:00, Closed Sat. and Sun. Reservations required for large groups. From Amino Station (Kyoto Tango Railway), 5-min. taxi ride. Visited a Tango chirimen wholesaler Yoshimura Shouten (株式会社 吉村商店 峰山支店). 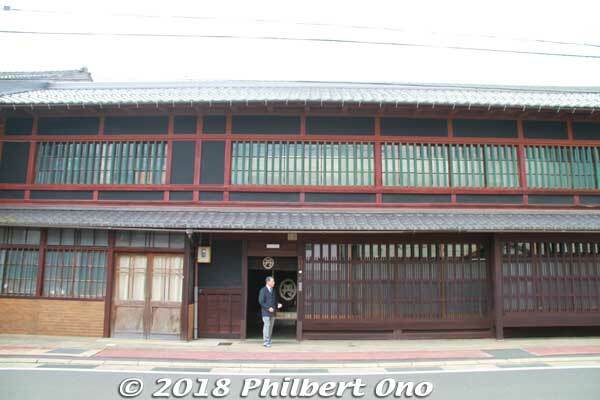 Founded in 1830 and based in Kyoto city, this is their branch shop in Mineyama, Kyotango. They are in this distinctive, traditional building rebuilt in 1930 after the big 1927 Kita-Tango earthquake. 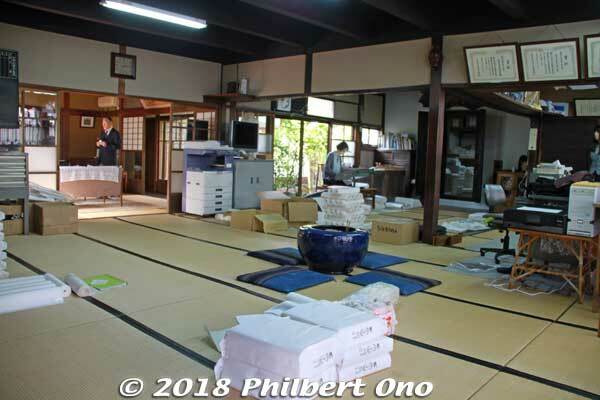 They have a small office space on the right, meeting room on the left, a fireproof kura storehouse in the back, and lots of floor space for textile merchandise. 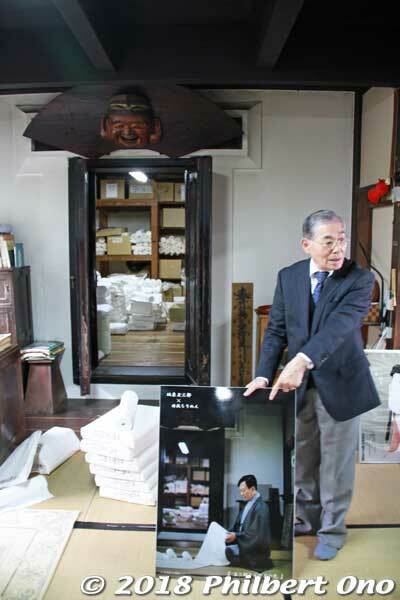 Above, Mineyama Branch Manager Yoshioka Hitoshi shows a PR poster of Bando Tamasaburo V posing with a Tango chirimen fabric in front of the shop’s fireproof kura storehouse. Tamasaburo V honored the store by posing here. He is one of the most famous and popular kabuki actors in Japan and Living National Treasure. He loves Tango chirimen fabrics, and kabuki costumes also use Tango chirimen. 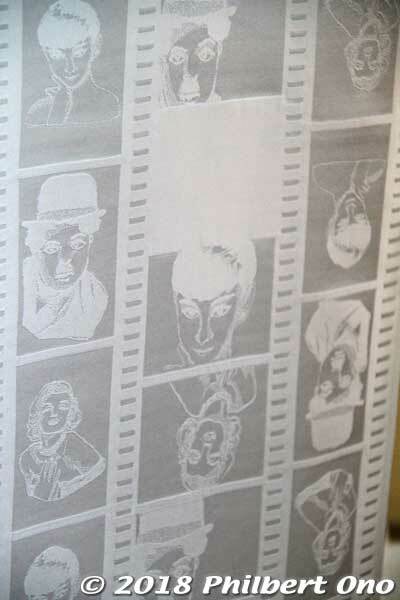 Yoshimura Shouten also creates its own designs like this “Hollywood chirimen” prototype with the the likeness of Audrey Hepburn, Charlie Chaplin, and Marilyn Monroe. 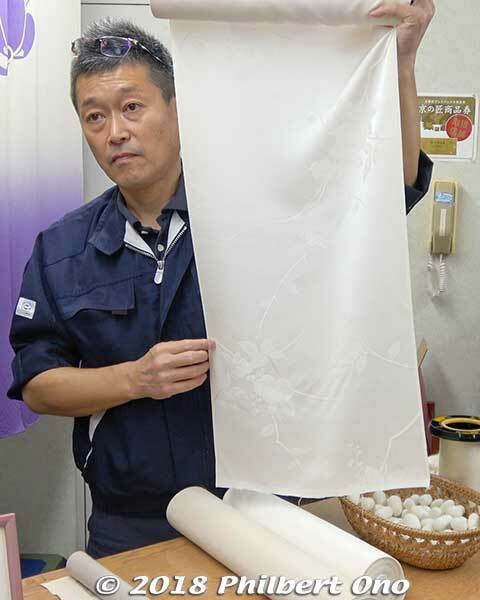 Above, a chirimen fabric inspector uses a light box to carefully check for any defects and flaws in the material. Any defects in the material will reduce its value and the fabric (or kimono) will be sold for less. Although Yoshimura Shouten is mainly a wholesaler, they also sell fabrics to individuals. 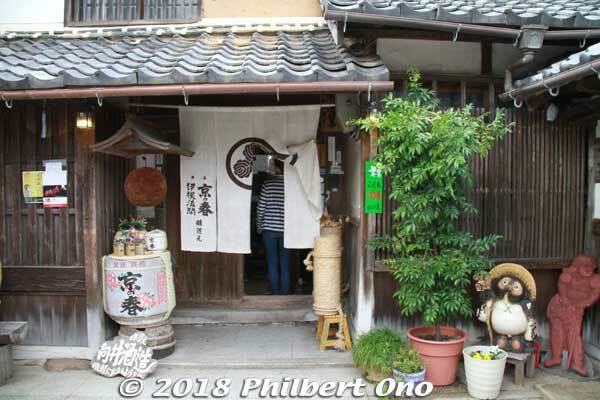 They offer tours of their shop, but reservations (in Japanese) are required. 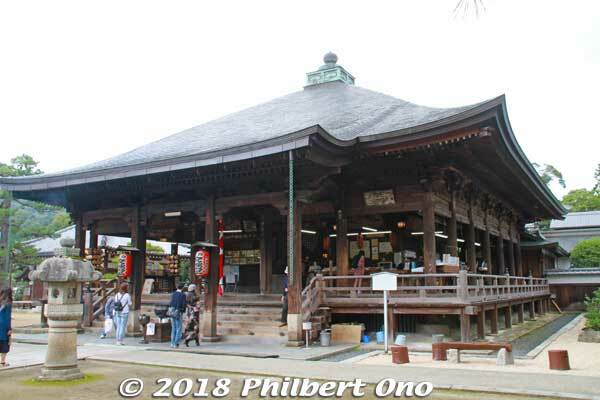 Kotohira Jinja Shrine (nicknamed Konpira-san 金刀比羅神社) in Kyotango greatly benefited from the patronage of rich, local Tango chirimen makers and merchants. Its headquarters shrine is Kotohira-gu Shrine in Kotohira, Kagawa Prefecture in Shikoku. It mainly worships Konpira (or Kompira), the god who protects sailors, fishermen, ocean transport, navy personnel, and other seafaring people. People also pray here for business prosperity, family safety, scholastic excellence, safe childbirth, recovery from illness, and more. The shrine was mosty destroyed by the 1927 Kita-Tango earthquake so most of the current buildings were rebuilt in the 1930s. The shrine’s Reisai Festival (例祭) is held on the second Sunday in Oct. when five floats (yatai 屋台) are pulled along the streets near the shrine and a large mikoshi portable shrine is also carried around. It used to have 30 ornate festival floats, but they were sadly destroyed by the 1927 earthquake. Kishima Shrine (left half of this shrine) flanked by koma-neko cat guardians. 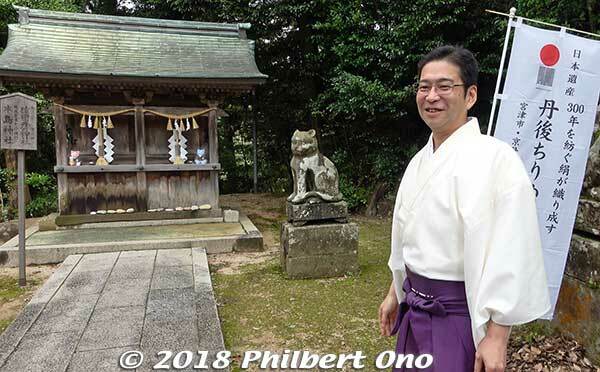 Kishima Shrine is unique in Japan for two koma-neko cat guardians (狛猫). Shrines usually have koma-inu lion-dog guardians (to ward off evil spirits), but only this shrine in all of Japan has cat guardians instead. Kotohira Shrine’s head priest Wakisaka Takuji (宮司 脇坂卓爾) explained it to us. Kishima Shrine has koma-neko cat guardians because silk farmers in the 19th century kept cats to protect their precious silkworms and cocoons from rats. Rats were a major problem for the silk industry since they ate the silk cocoons and worms. 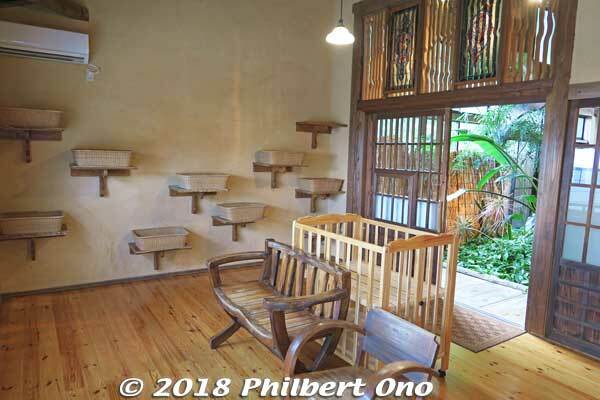 So cats saved the local silk industry. 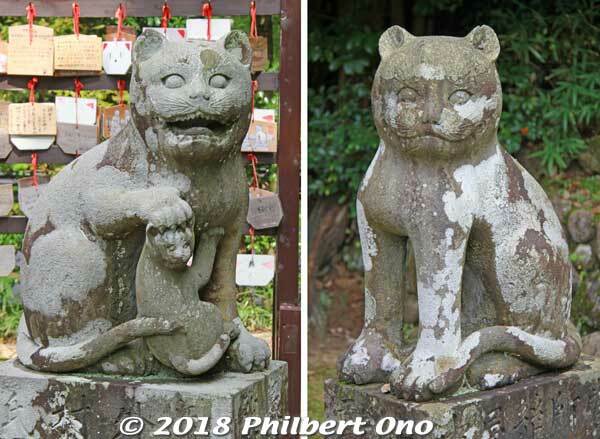 The koma-neko cat guardian statues were donated in 1832 by silk merchants and wholesalers such as the Tonomura family (外村家一族、岩滝のちりめん問屋、山家屋の小室利七) who were textile merchants from Higashi-Omi (Gokasho), Shiga Prefecture. From Mineyama Station (Kyoto Tango Railway), 800 meters. Parking available. Chirimen Kaido Road, sake cellar on the left. 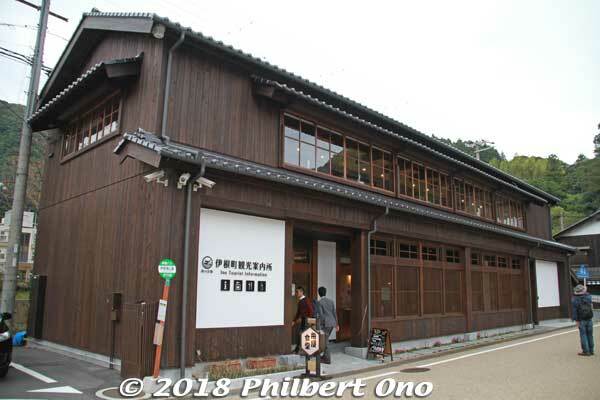 Our final Tango chirimen stop was the Chirimen Kaido Road (ちりめん街道), a Tango chirimen manufacturing area and distribution center in the former castle town of Yosano. The chirimen was mainly shipped to the city (Kyoto). There was a railway to Kyoto city where the fabrics would be sold, dyed, or sewn into kimono. Chirimen Kaido Road has an easy walking route to see traditional buildings still remaining. 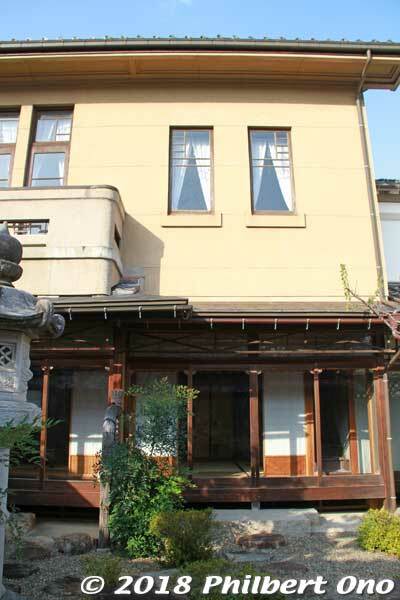 One home on the Chirimen Kaido Road the public can enter is the Former Bito Family Merchant’s House (Kyu-Bitoke 旧尾藤家). 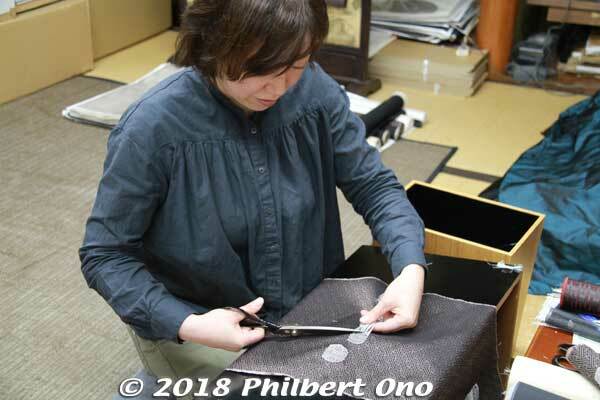 The Bito family was a raw silk and chirimen wholesaler since the Edo Period. Very prominent and rich local family who also became active in local government and business during the Meiji Period. The house was originally a farmhouse built and expanded during 1863 to 1930. Before air conditioners, they had these sliding slats for ventilation in summer. 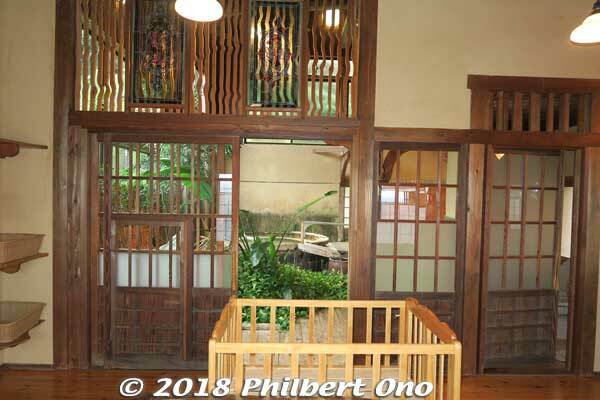 This part of the house had a Japanese-style first floor, and a Western-style (Spanish) second floor. Built in 1928 and the most impressive part of the house. 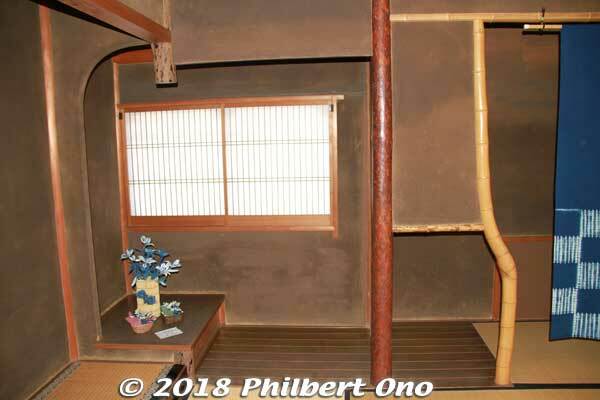 The Japanese-style first floor used very expensive materials. These thin wood pillars are shochikubai (matsu pine, bamboo, and ume plum tree). 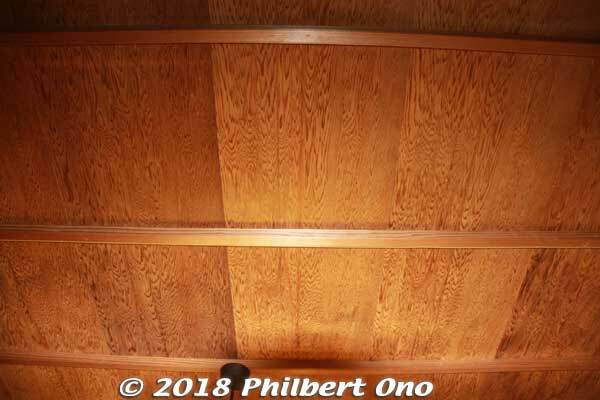 The 1st floor’s ceiling wood is very rare, made of yaku-sugi cedar wood (屋久杉). Yaku-sugi is hundreds of years old, native to Yakushima island in Kagoshima Prefecture, and now illegal to cut down. Western-style (Spanish) 2nd floor bedroom. 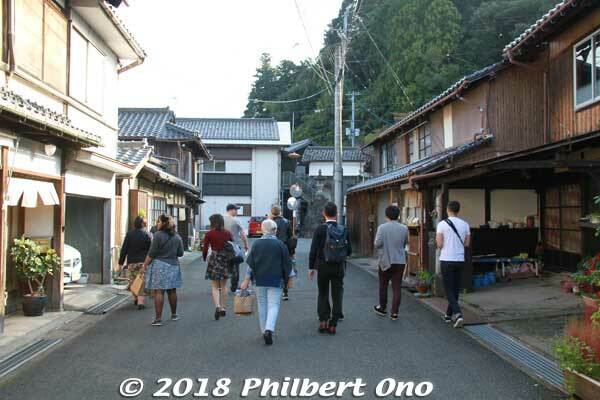 After the Bito Home, we continued our walking tour of Chirimen Kaido Road. 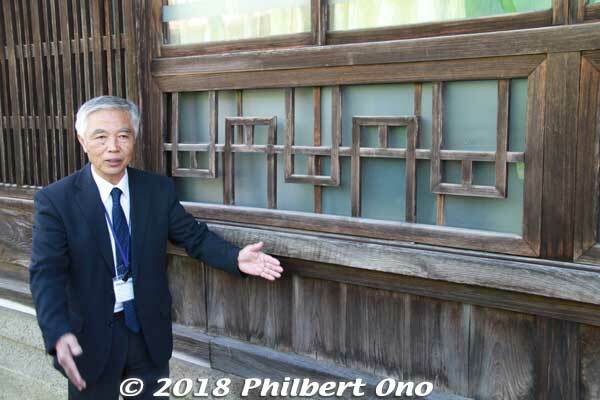 Our guide, Aoki Jun’ichi, from Yosano Tourist Association, showed this exterior lattice design featuring the kanji character for “Tan” (from “Tango” 丹後) which is similar (by no coincidence in this case) to the kanji character for “yen” (円). This home above housed a chirimen factory and these windows let in light and air, but kept out prying eyes from passersby in the old days (when people were shorter I guess). Chirimen makers had secrets to keep. Our walking tour ended at the Yosano Town Hall’s Kaya Branch which used to be a train station on the Kaya Railway. Sure learned a lot about Tango chirimen. This Tango visit has forever changed my image and knowledge of it. One thing we missed seeing was the Tango Chirimen History Museum (Tango Chirimen Rekishi-kan 丹後ちりめん歴史館) housed in a former textile factory. It is 10 min. by car from Chirimen Kaido. Free admission. Shorenkan Yoshinoya (昭恋館よ志のや) is a hot spring ryokan on the Tango Peninsula (Kyotango) where we stayed for one night. Founded in 1928, it has 11 guest rooms. The ryokan has been patronized by Japanese celebrities since the 1970s. 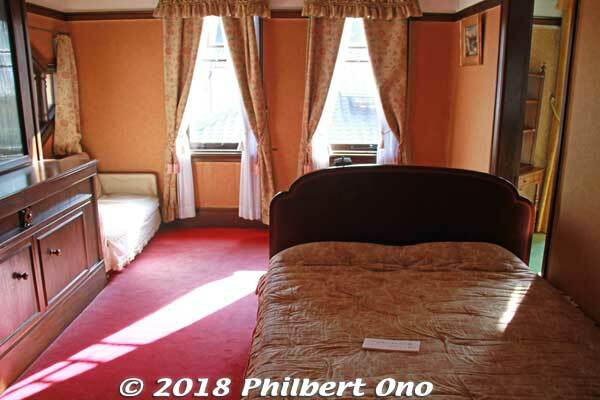 It costs ¥17,000 to ¥18,000 per person per night including dinner and breakfast. However, during crab season (Nov. to March), the price can go up to ¥30,000 or more. 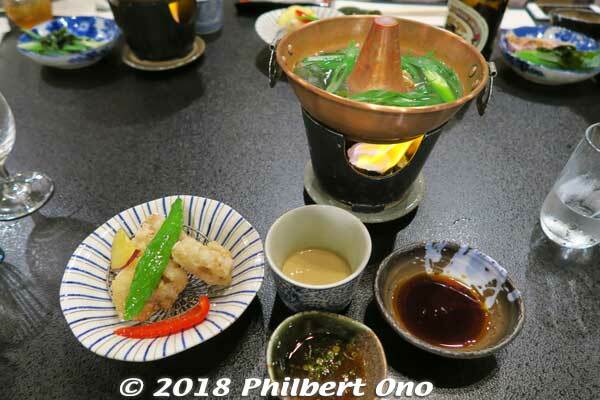 This ryokan is proud of its crab cuisine. My nice, Japanese-style room (at night). A small part of our dinner. 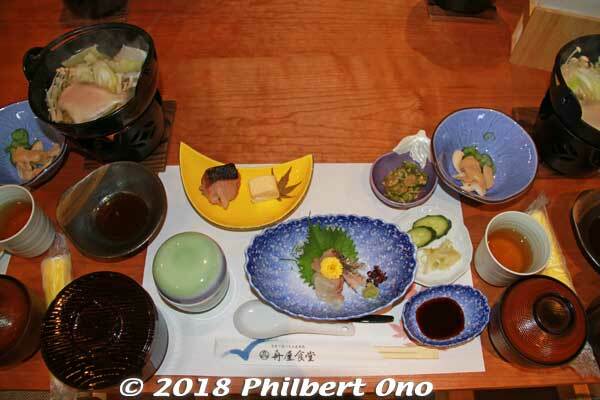 Shorenkan Yoshinoya ryokan is probably more famous for its food, especially crab while it’s in season (Nov. to March). But it wasn’t crab season when we were there in Oct. so we didn’t have any crab. But the food was still excellent. 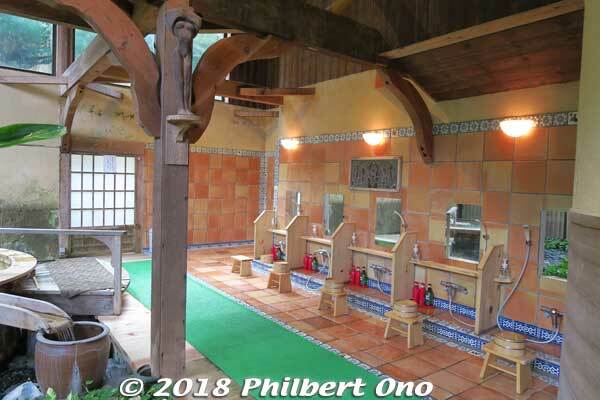 Another highlight of Shorenkan Yoshinoya was the two hot spring baths delightfully designed by an American. Even the dressing room for the bath named “Shoren-no-Yu” (昭恋の湯) was impressive. (“Shoren” means “Love of the Showa Period.” And “Yu” means hot spring water.) As you can see, the design was very nice. These baths are not segregated so they set different bathing hours for men and women. Entrance to the bath area. Baby crib in front. The bath in a wooden barrel. Shower/soaping area. Ceramic tiles are Mexican. 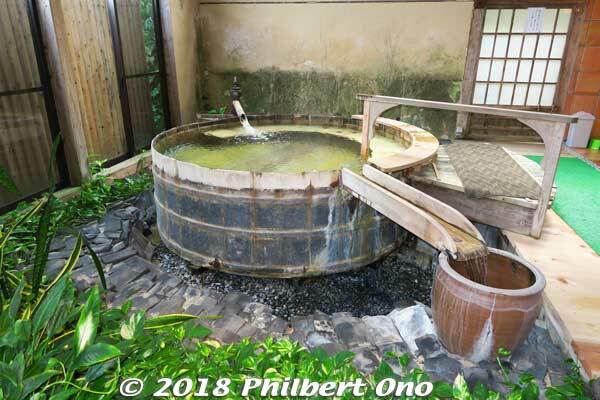 Since the ryokan celebrates the Showa Period (implied by the name “Shorenkan”), Alexander aimed to make the bath have a Showa/Taisho Period feel. It was a tough job because they had to strip this abandoned house and haul everything in and out manually. No accessible road so they had to roll the wooden barrel tub to the building by hand (so the tub couldn’t be rectangular). The ryokan’s other bath was named “Vidro-no-Yu” (ビードロの湯), also designed and built by Alexander Wilds and his artist wife Yukiko Oka. The glass windows were a design highlight (hard to see here because of the steam and dark night). The glass door opens to a balcony with a bath. 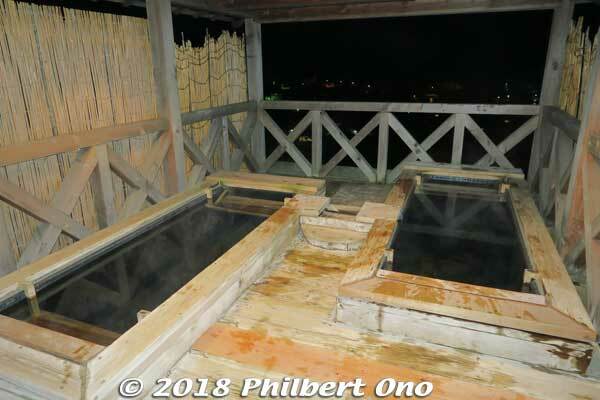 Vidro-no-Yu outdoor baths at night. Ocean view during the day. It was great that we could try these two different baths during our overnight stay. The hot spring water supposed to lower your blood pressure and relax you. Nearest station is Amino Station﻿ (Kyoto Tango Railway). The ryokan can pick you up at the station for a free ride (20 min.). Inform the ryokan by the day before you arrive. Check-in after 2 pm, check out by 11 am. 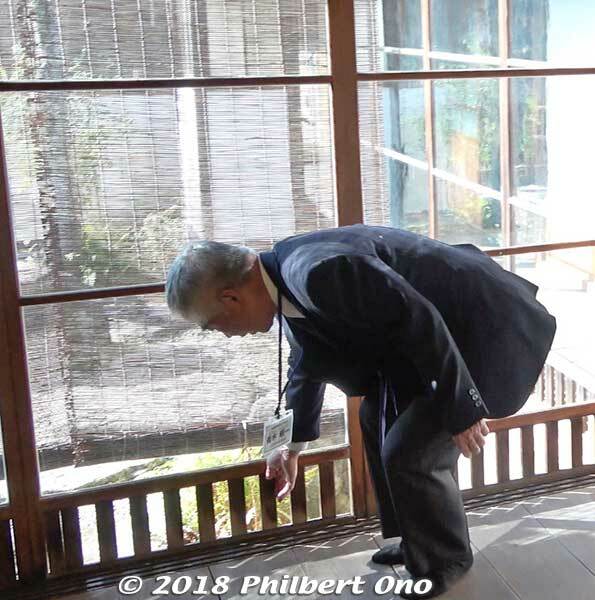 I got in touch with Alexander Wilds by email in Nov. 2018 and he was gracious enough to answer my questions about Shorenkan Yoshinoya’s baths. For Shoren-no-Yu, did you design everything? If not, which parts did you design? I designed and built almost all, including the garden. I did not make the shelves for holding clothes in the changing room. Those were made by my friend Mr. Sashimi of Shimane Prefecture. There is also a stained glass window or two by my mother. A lot of the “design” is invisible—the plumbing, working out water delivery and recycling. What was your design concept behind Shoren-no-Yu? Well, that is difficult to answer. 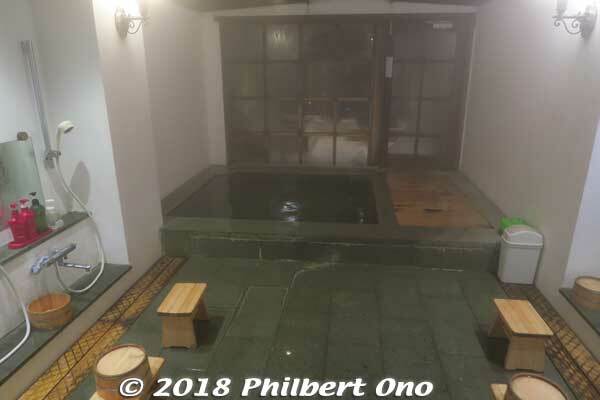 I was given a nearly impossible task—take an abandoned house with no access to road or crane (everything had to be carried from the street up the mountain by hand) and convert it into a world-class onsen (hot spring bath) with three months working time, start to finish. So I stripped the old building down to the bones, and used the parts left over to make the onsen. It is essentially made from scrap wood and materials. The form is what was already there, plus whatever I could make with whatever I had. The Hotel, as the name implies, is a celebration of Showa Period design, so I was aiming to make a beautiful bath in a Taisho/Showa period feeling with modern flair. What are the main design or architectural features of Shoren-no-Yu? I am not sure what to say—what you see is what you get. The layout was dictated by the foundations already there. The high ceiling is what remains from demolishing the second floor, the shower area is where the old staircase was, etc. Where did you get your design ideas for Shoren-no-Yu or what inspired the design of Shoren-no-Yu? Is it reminiscent of the early Showa Period? A blend of Japanese and Western elements? 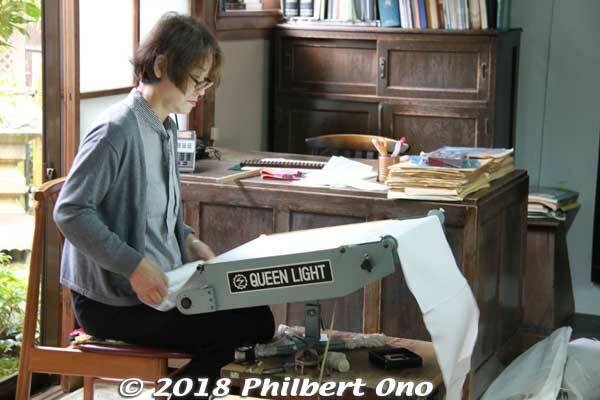 I am a sculptor by trade and training, meaning, it is all about problem solving—one has an objective (make a beautiful onsen), and whatever materials are at hand (an abandoned derelict house), and a few tools. So the design concept is take the pile of scrap and build what you can, and make it as beautiful as possible. The “design” is the art of the art—creative problem solving, with a good sense of proportion, sensitivity for texture, color, etc. For example, I had to fill in a huge space where the garden is; I had a mountain of roofing tiles to get rid of; the garden is built of roofing tiles. That sort of thing. 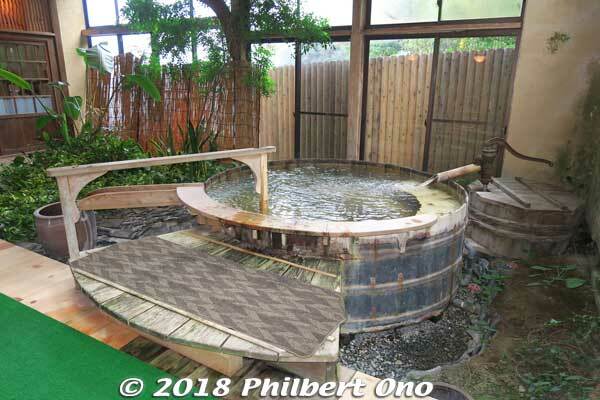 By the way, the reason that the bath itself is a round wooden tub is so that it could be rolled up the mountain. The wood pillars and beams were also designed by you? Yes. The beams were all straight. I cut them into curves with a small bandsaw and then glued/bolted them back together to make arches (like I said, I am a sculptor). Did you also create the ceramic tiles? The artwork as well? I had the tiles in my pile leftover from another project—they are Mexican. Vidro-no-Yu’s name comes from the widows. We did not name anything—that came from the owners. Those are all by my wife, Yukiko Oka. That bath is a 50/50 design by us. The old bath was dingy and dirty, so we renovated it. They wanted a rooftop bath, and it could only go in one place, and there was a limited amount of water, so I made the baths smaller to have enough water for the outdoor bath. Again, it was take what you got, and make what you can. I am quite proud of that work, by the way. Starting a design from scratch is child’s play—converting old baths into works of beauty takes much more creativity. The name comes in respect for my wife, Yukiko Oka, and her designs. She is the artistic genius in the house. She has great taste and imagination, and I have good problem-solving skills. We make a great team that that sort of work. How did Yoshinoya find you or how did they decide to have you design the baths? 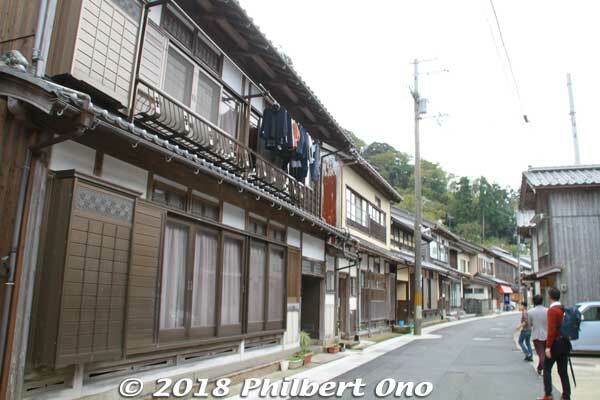 I was living in Omori-Ginzan (Shimane Prefecture) where I had built an art gallery from old houses. 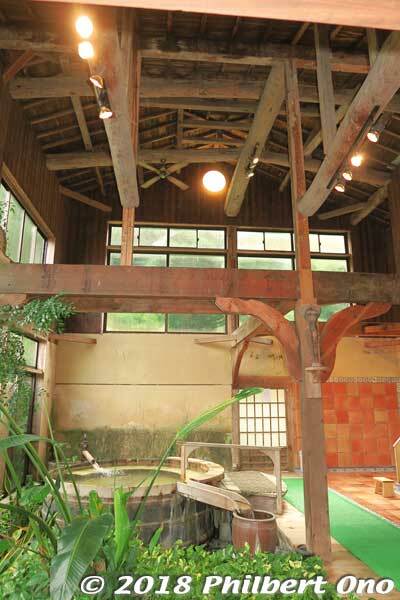 Mr. Matsuba Daikichi (Gungendo) introduced me to Mr. Fukuyama who asked me to build an onsen in similar taste and style. When did this design project start and end? Shoren is 2003, Vidro is 2005. Both began in June when the hotel closes for the season, and opened November 1 for the beginning of crab seson. What is your artistic/design/architectural background? I am just a sculptor (Google my name and see my work, also for Yukiko Oka). I have been in Japan since 1985 studying art and design. I do not consciously mix Japan and the West, old and new. I do not copy, nor do I insist on originality. I just make whatever I make as best I can using whatever I have—no method, no guru. 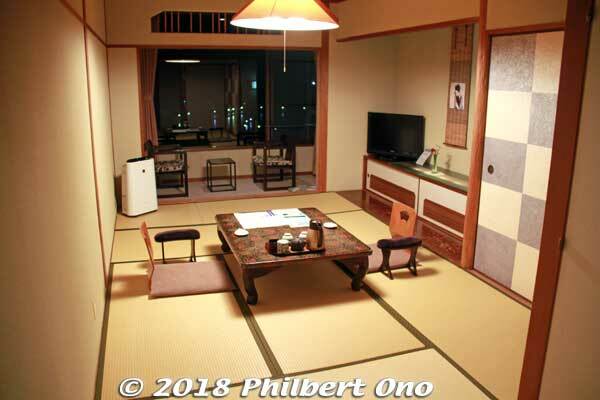 What other rooms or interiors have you designed in Japan that the public can see? All other architecture is in Shimane, mostly in Iwami-Ginzan. There are two buildings (I do not know current names) and the Abe House which belongs to Gungendo and guests can stay there (for a fee). You teach in Yamanashi Prefecture? 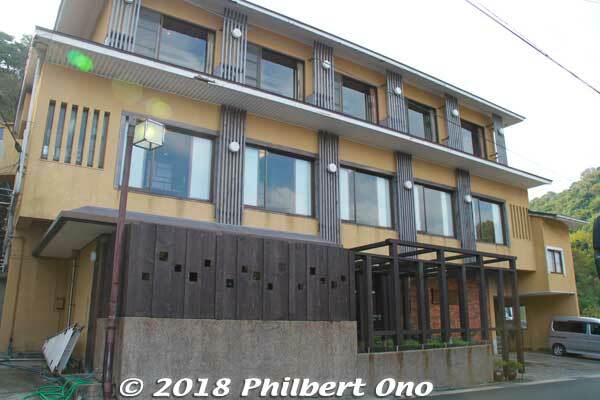 I currently live in Yamanashi, but I will retire in March and return to western Japan (Hagi, Yamaguchi) where I hope to return to art and architecture. I will hang out my shingle and open for business April 1, 2019. I have made art all my life, and have loved Japanese art and design since I was a little boy. I am neither rich nor famous, but I am the luckiest man alive—I get to spend my life doing what I love, making beautiful things. Tango Peninsula has a lot to offer with Ine, chirimen fabrics, scenic coasts, geological features, and the food. More attractions in the area are listed below.